This is a report of our August 2018 19-day trip to the three Queensland State corners. 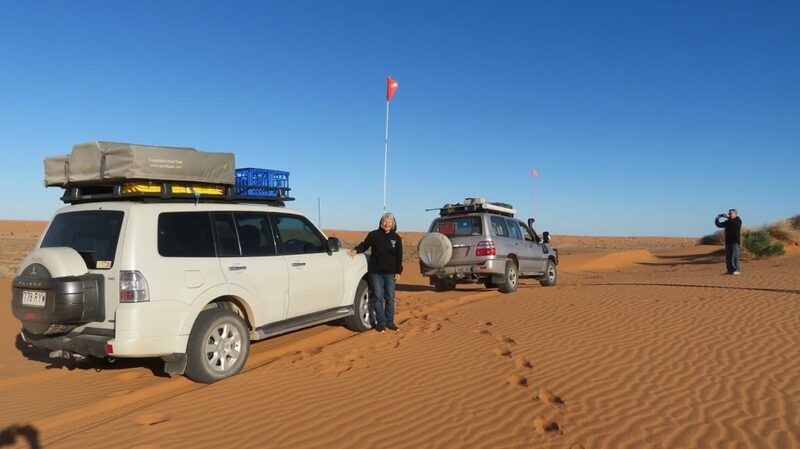 This 5,000km trip in the Pajero with the roof top tent will take us through outback Queensland, across the Simpson Desert (Munga Thirri) and Sturts Stony Desert into remote areas of the Northern Territory (briefly), South Australia and New South Wales. We’re travelling with our buddies Doug and Leura. Departed home at about 1130am after last minute packing, watering all the plants and making sure the chickens have plenty of feed and water. Rob and Anne and Ric and Gill will keep an eye on them and collect the eggs while we’re away. First, and hopefully last calamity of the trip occurred at our very first stop! I couldn’t open one of the drawers in the back of the Pajero – the food drawer! It appears that something has slipped down below the locking mechanism preventing it from opening. After half an hour of trying to prise it open, tilting the car sideways and nose-down on the steeply sloping road to try to move the blockage we gave up, just a bit stressed by now (understatement!!). When two crazy people doing weird things with their car aren’t there Rogers Park in the State Forest outside Yarraman becomes a lovely quiet, well-treed, day-use only park with picnic tables, covered tables, BYO wood BBQs and loos. Yay. We’re off on our adventure. Morning tea break at Rogers Park. Looking happy here, but not for long once we discovered we couldn’t open the food drawer. On the way we passed farms with ‘I support New Acland Mine’ posters and others extolling the virtues of farms and environment. 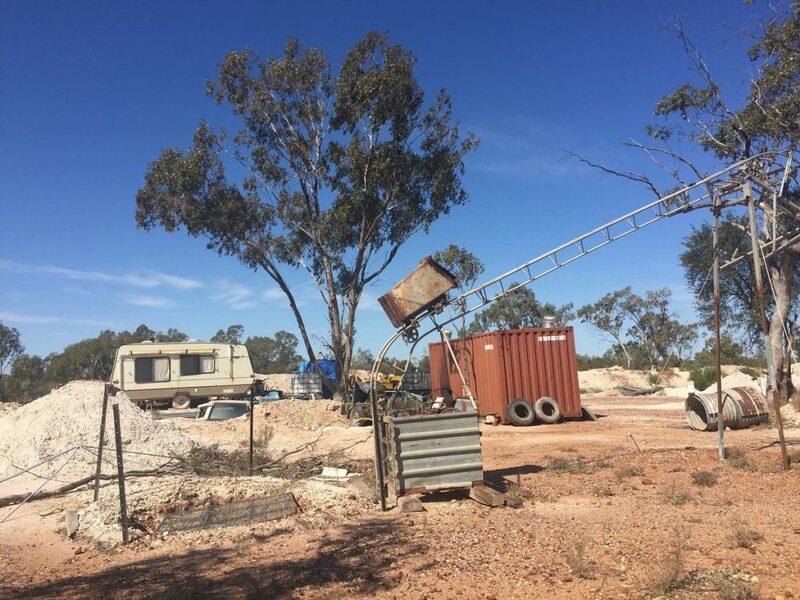 Significant expansion of the New Acland mine is proposed, but was rejected last year by the Lands Council due to concerns about the ground water. However an appeal to the Supreme Court in May this year overturned their ruling. The battle is not yet over… watch this space. Bowenville Reserve, our campsite for the night, is a huge area a couple of kilometres outside Bowenville and bounded by a loop of Oakey Creek. It’s a free camp with picnic tables and a clean flushing toilet. A lovely spot, except for the occasional smell from the cattle feed lot up the road. 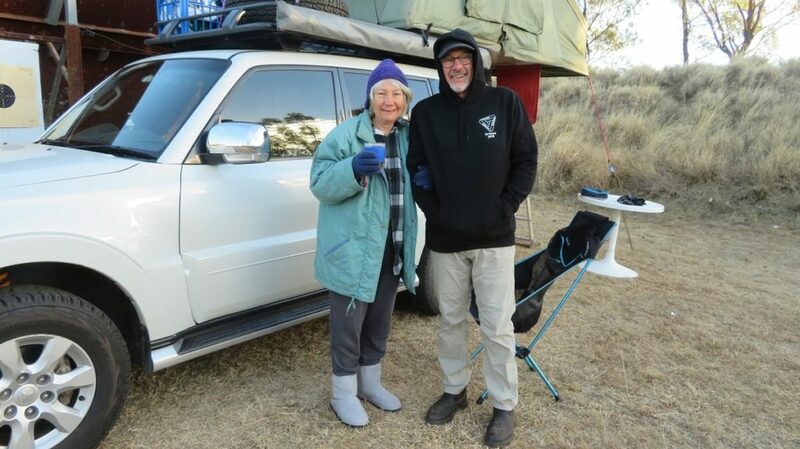 Doug and Leura had already arrived and set up their tent. Campsite at Bowenville Reserve. Doug and Leura with their tent, us with our rooftop tent. With solving the drawer issue still an imperative Steve finally drilled a hole beneath the lock and dislodged the salt shaker that caused the problem – phew, it wasn’t looking good for a while there. A walk along Oakey Creek late afternoon was just the relaxation we needed. It has plenty of water in it, despite the whole area being very dry. Reflections in Oakey Creek at Bowenville. A very pleasant evening was spent chatting and laughing before an early night. Feels funny to be back in the rooftop tent – it’s been a while. A French champagne ‘toast’ to our first night. Not a lot to report on today. We stopped briefly at the Chinchilla Saddlery for Leura to catch up with her cousin who owns it. It’s one of those amazing stores packed to the brim with clothes, boots and all manner of horsey stuff, including saddles – fun to explore. Chinchilla looks like an interesting town, noting among its accomplishments the first place to release the Cactoblastis moth which proved to be very successful in bringing the invasion of the prickly pear under control. They also celebrate the melon festival here in summer. At Miles we stopped for brunch. Lots of roadworks happening in Miles and for quite a distance along the Warrego Highway. The landscape is generally flat and brown – grasses burnt by recent frosts or fields of stubble after harvest. This is a large grain-growing region. 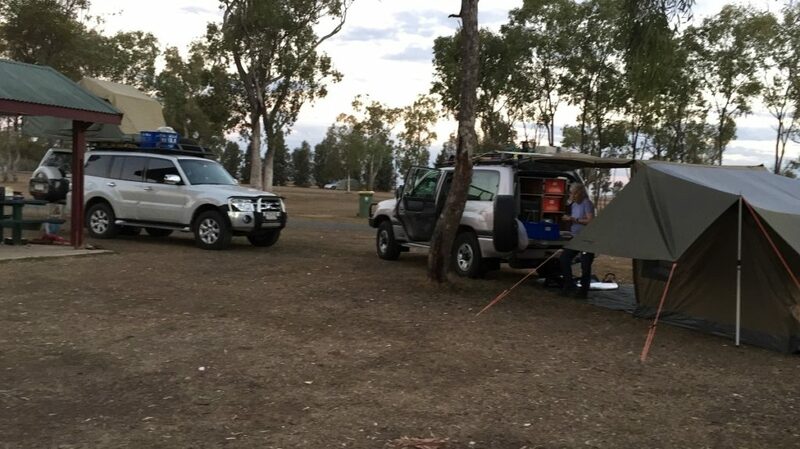 We’d planned to stay at Wallumbilla, however after a short drive around town and not being impressed with the showgrounds camping area and amenities we moved on to camp at the Clay Target Gun Club in Roma. Here they’ve very kindly situated us on a grassy patch protected from the strong winds that are blowing and away from the packed out caravan area. 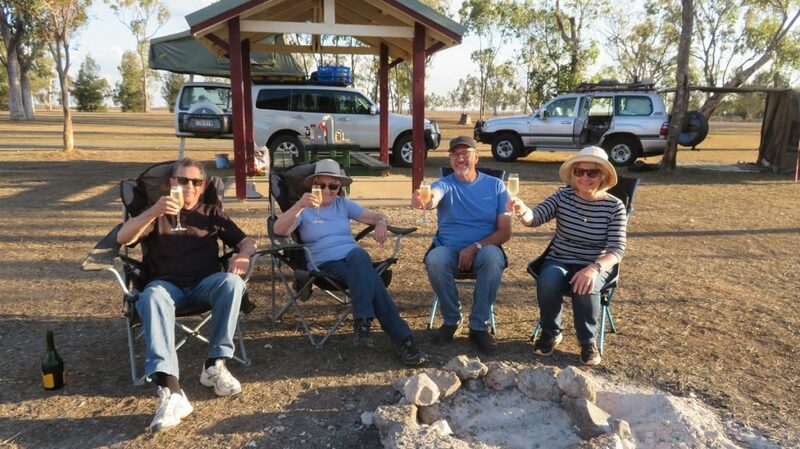 A drink, or two, at the clubhouse in the afternoon went down well before dinner back at the tents. It’s forecast to get down to zero degrees tonight. The hot water bottles have been filled and we’ll soon be under a few layers of doonas and blankets. While it’s very chilly overnight and in the mornings, as soon as the sun gets up it starts warming up to the low 20s with cloudless blue skies. So a slow start to the day ensures we don’t feel too much of the chill. First stop today was Mitchell where I’d promised everyone that the Artesian Spa cafe sold the best Eggs Benedict ever, according to my secret source (WikiCamps). Not so I’m afraid – well not on a Tuesday anyway! After that big disappointment, that I was reminded of for the rest of the trip, we spent an hour or so partaking of the beautifully warm Artesian Spa waters, maybe not quite the 38C they said it was, but definitely well in the 30s. It was hard to get out, particularly as there was a sneaky, chilly breeze blowing. Outside of the artesian spa pool at Mitchell. Sorry, didn’t take the camera in with me. The countryside west of Roma is a bit more interesting – more trees, lusher grasses. The amount of road kill was extraordinary – an emu, a pig, a steer and dozens upon dozens of kangaroos. The road trains travel all night and don’t pause for anything. A cuppa stop at Morven then on to Charleville where we’re booked into cabins for two nights at Bailey Bar caravan park … happily as the overnight temperatures are set to drop even lower. Tonight the van park owners are putting on a spit-roasted pork to be served around the campfire. We’re there! – not bad. 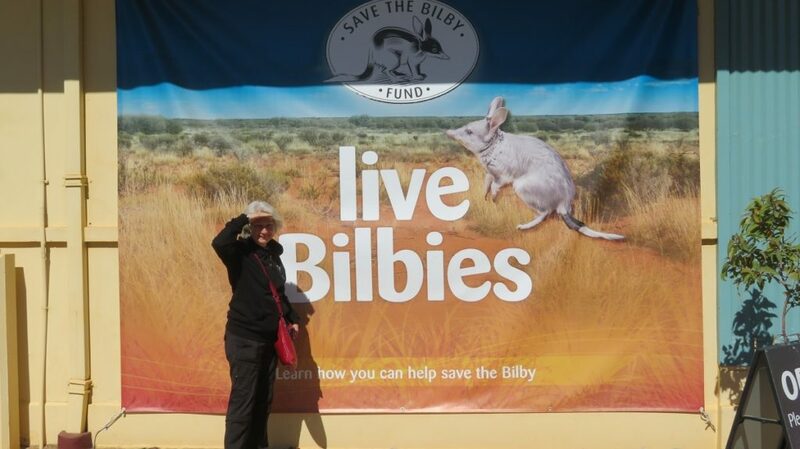 Charleville promotes itself as a centre for observation of the stars, and conservation of the bilby. Wednesday morning Steve and I went to the Cosmos Centre. 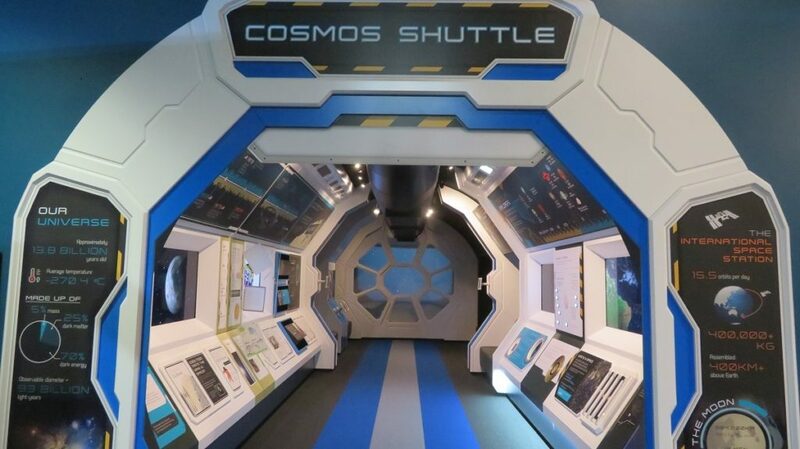 The very engaging main display is a mock-up of a Space Shuttle. The information and displays are excellent. The space shuttle mock-up. All the screens were interactive and very informative. During an interesting talk given by one of the astronomers we got to hold an actual meteorite that was found a couple of hundred kilometers from Charleville. It was so hard that even diamond drills couldn’t cut it and because it’s so dense it felt really heavy. Fascinating. 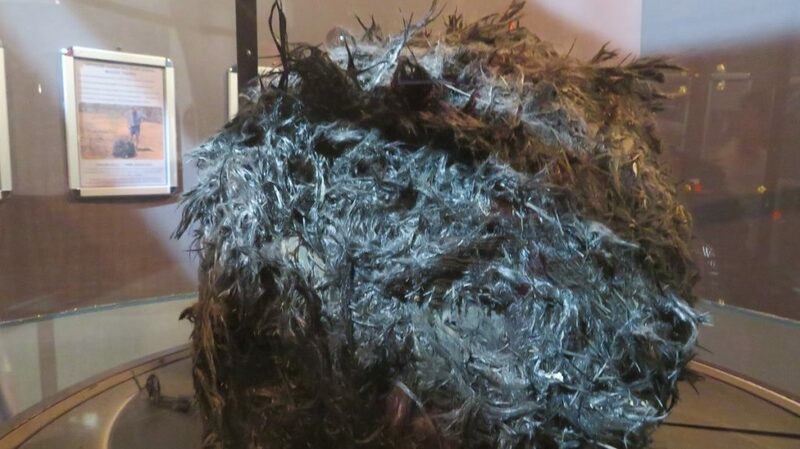 There was also some ‘space junk’ on display which was found just west of Charleville – a 20kg ball of black carbon fibre which had been either a hydrogen or a nitrogen fuel cell. It would have entered earth’s atmosphere looking like a shooting star. There’s about 5000 tonnes of space junk orbiting the earth at any one time and this is a bit that came back. Lunch was had in the park surrounded by geese, two roosters and a bantam hen .. yeah, a bit weird. Weirder still though was the Steiger Vortex guns in the park. These cone-shaped barrels were first used in Europe to fire a gas into clouds causing rain instead of the expected hail, which would destroy crops. A meteorologist named Wragge thought they could be used to produce rain to end the drought in Australia. They were trialled in Charleville in September 1902, the six guns were set up in two rows, spaced over a kilometre apart and fired at two minute intervals. Unfortunately the experiment met with no success, with no sign of the desperately needed rain. 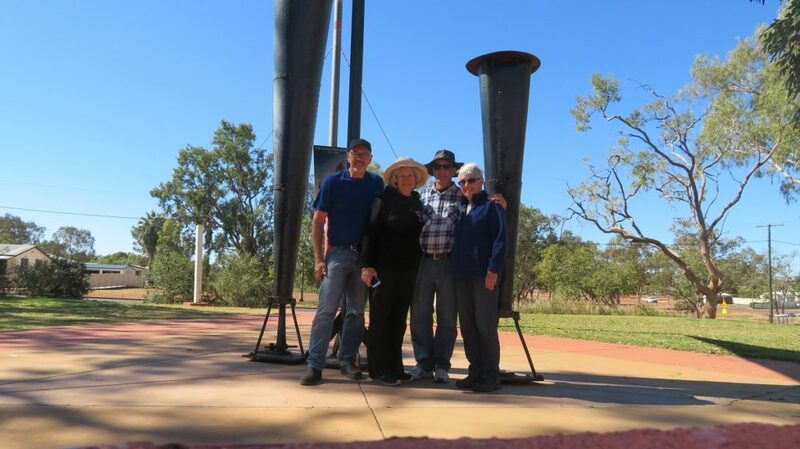 The Steiger Vortex Gun in the park at Charleville. An idea to end the drought – pity it didn’t work. From here we headed off to the Bilby Experience. It’s great to see the conservation work being done but there’s a long way to go – feral cats and foxes have nearly wiped out this lovable little animal along with lots of other little marsupials and reptiles. Dinner tonight was at the On the Rocks restaurant – fantastic meals. Then, once very warmly clad, back to the Cosmos Centre where we gathered to view the night sky under the instruction of an astronomer. Four very powerful telescopes were set up to cater for the 30 or so keen tourists, including us, to view selected stars and planets. Excellent experience – a must do. A fairly long drive today (for us), 315km, to Eromanga, stopping only twice for a cuppa and later at Quilpie for lunch. Quilpie’s rest stop had tables, but no shade; whereas at the turnoff to Eromanga not too much further on, was a very good picnic area with shaded tables and toilets – mentioned this as a reminder for when I pass this way again. Of note on today’s drive were the many emus grazing, and consequently the roadkill tended to be far more emus than roos. Driving these roads we are super-vigilant looking for wildlife that could run in front of us at any moment. While the bull bar is good protection, we didn’t want to kill anything and if it hits at just the wrong angle it could cause a lot of damage to the vehicle. Wide roads, broad shoulders, low-growing vegetation, flat plains. On the road to Eromanga. Eromanga’s claim to fame as you drive in is a big sign proclaiming it to be the furtherest town from the sea. It has a population of just 45 residents and has a pastoral and opal mining history. However we’re here to see the dinosaurs. 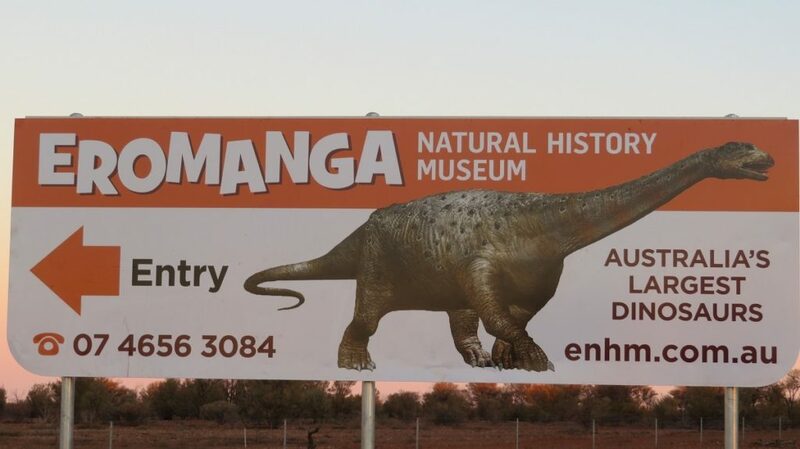 Only about 14 years ago significant paleontological discoveries of Australia’s largest dinosaurs were made on a cattle property near Eromanga. Several dinosaurs have been unearthed and the area is being heralded by scientists as the most prolific dinosaur site in Australia. The Eromanga Natural History Museum is home to Australia’s largest dinosaur, a 95-98 million year old titanosaur called ‘Cooper’. Not only does the museum have dinosaurs but some of the world’s largest mega fauna and a variety of micro fauna which were discovered nearby in Eulo and are thought to be 50,000 to 100,000 years old. A dinosaur bone. Note the plaster of paris and alfoil packages on the table. We visited the Museum just in time for their 3pm tour. 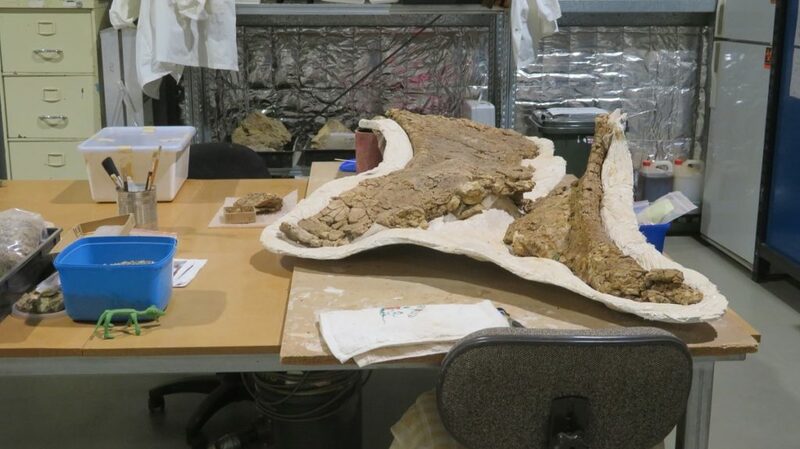 It was great – good descriptions of the dinosaur era and the megafauna era and how they’re finding, retrieving, preserving and displaying the bones they’re finding. I learnt a lot and enjoyed the presentation. And I got to hold a genuine dinosaur bone! 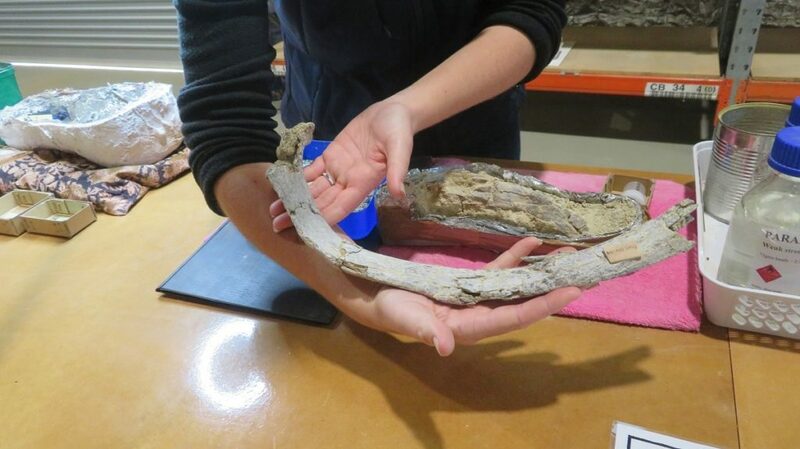 The bone is returned to its cast during the prep phase for protection. Eromanga Natural History Museum. Doug and Leura booked into the new motel rooms at the dinosaur centre, but we’re pretty comfy in our rooftop tent, so we’re back at the caravan park. They’re going to open a new caravan park at the centre in the future … badly needed as the one in town is, needy! Today we’re only going as far as Cooper Creek, about 3 hours up the road. Cooper Creek, the Diamantina and the Georgina Rivers and their many, many ephemeral tributaries make up the Channel Country of south west Queensland. This is a rich grazing area, but not suitable for cropping due to unpredictable rainfall. The Cooper begins in northern Queensland as the Barcoo and Thompson Rivers, inland of about Townsville. Most of the water from the Cooper either evaporates or stays in permanent waterholes and lakes. Only when there is significant flooding in its upper reaches does the water fill the Cooper’s numerous channels creating huge flood plains and bringing the arid country to life, before emptying into the usually dry salt lake, Lake Eyre. After crossing dry creek bed after dry creek bed it was amazing to come across the wide waters of Cooper Creek. There’s free camping on both sides of the road and both sides of the creek so heaps of camping sites available. There’s one clean, flushing toilet. We were all surprised at how few campers there were here tonight – only another two vans where we were and they were a long way from us. Sitting by the banks of Cooper Creek near Windorah. Our campsite in the background. 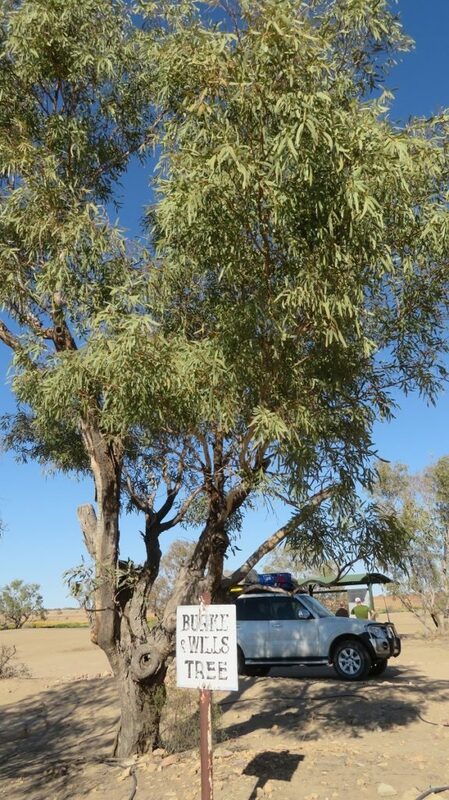 Our campsite was right at the edge of a short, steep riverbank lined with glorious old River Red Gums. What a treat to be here, in such an idyllic setting, more or less by ourselves. How’s this for a restaurant with ambience? 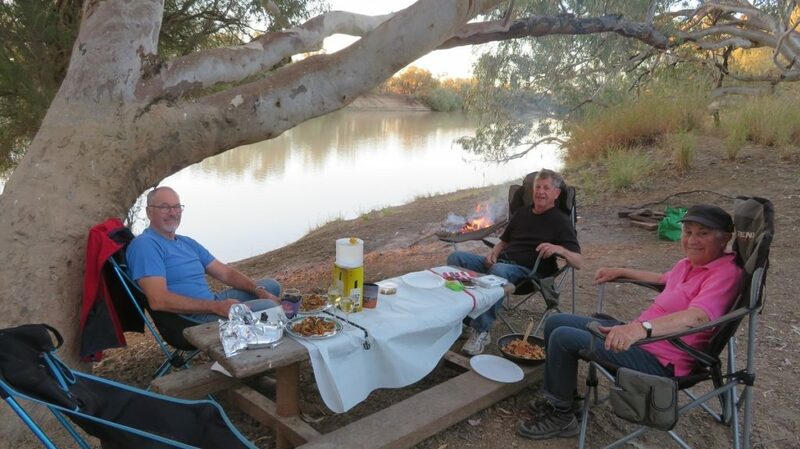 Dinner on the banks of Cooper Creek, Windorah. The weather remains beautiful – chilly nights (around 5C) awakening to cloudless blue skies and daytime temperatures in the low 20s. Off to Birdsville today, but first we drove through the nearby town of Windorah. Another small town, we were quite taken with their solar farm! The plant uses five concentrated solar dishes each containing 112 x 1 metre-square mirrors. The five solar dishes sit on 13 m masts and can rotate 360°. They provide all of Windorah’s daytime electricity needs for 10-months of the year, diesel generators providing the rest. 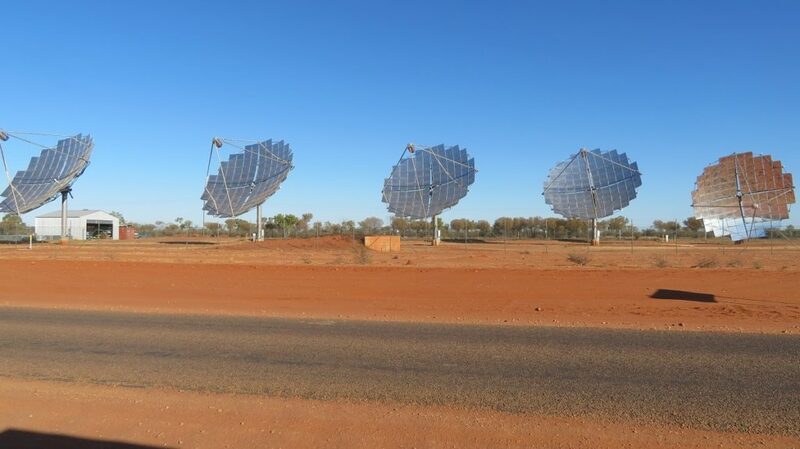 The mirrored solar panels that meet a significant amount of Windorah’s power needs. The countryside continues to be flat, with only a few weathered hills interrupting the horizon. 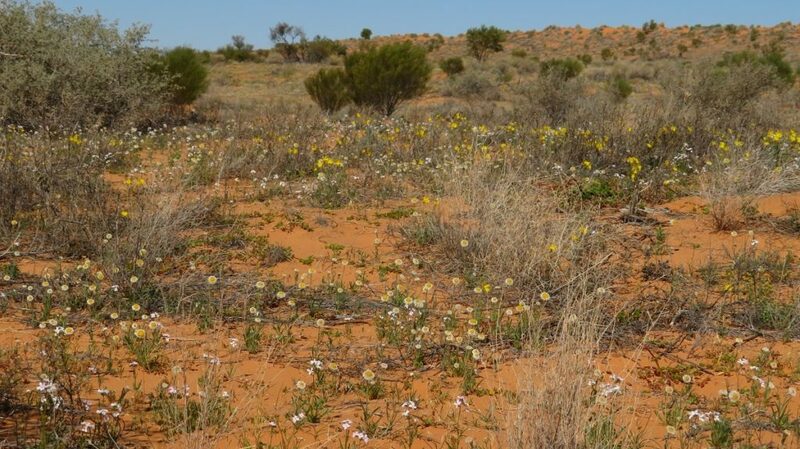 We travelled through either bare clay pans, or spinifex covered red dirt, or the red gibber rocks of Sturts Stony Desert, with low mulga trees along the dry river beds. We saw no wildlife other than birds and only a few cattle. 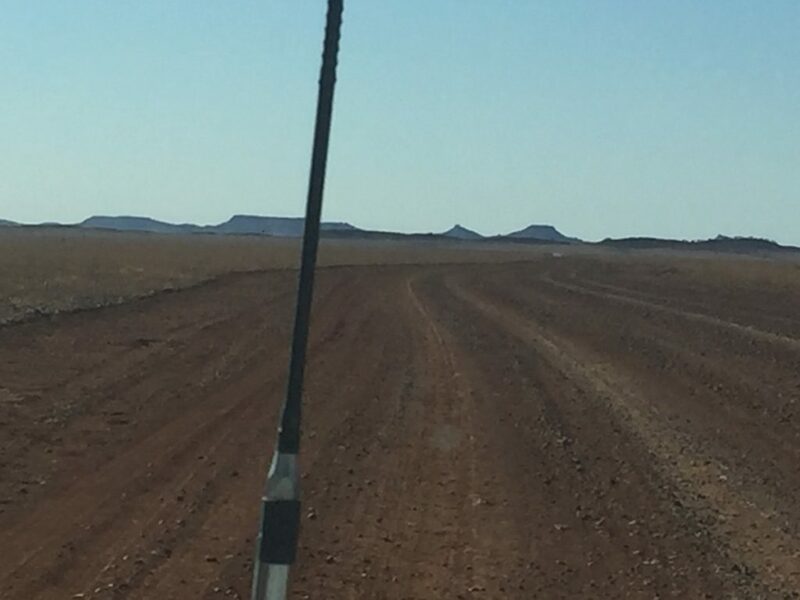 Soon after turning on to the Eyre Developmental Road the bitumen ceased and the road condition deteriorated in places; very dusty, rocky and corrugated. Not pleasant driving! Closer to Birdsville the road became sandy and we started seeing our first sand dunes. 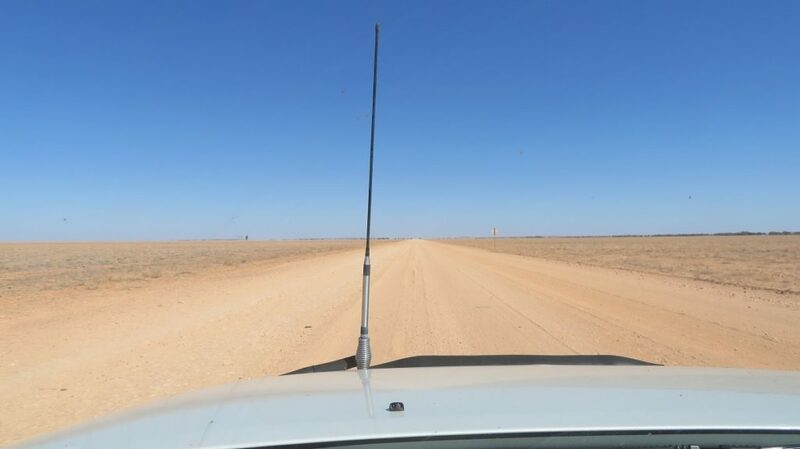 The road to Birdsville. This section looks pretty good, but some sections were very rough. However, there were a few interesting things to see along the way. First stop after Cooper Creek was at JC Hotel Ruins. It’s hard to imagine there was once a thriving establishment here, with nothing remaining but mounds of clay, broken bottles and rusting iron. Apparently the cattle baron who owned the nearby property got weary of having to pull his drunken jackaroos out of the the pub, so he bought it and closed it down. We also pulled over to see the ‘Hole through the Hill’ on Mt Henderson. Yep, that was worth a stop and a laugh. Yeah, OK, it’s true – there is a hole in the hill. The smaller flat-topped hill has a hole on the right hand side near the top. If you expand this photo you may see it. 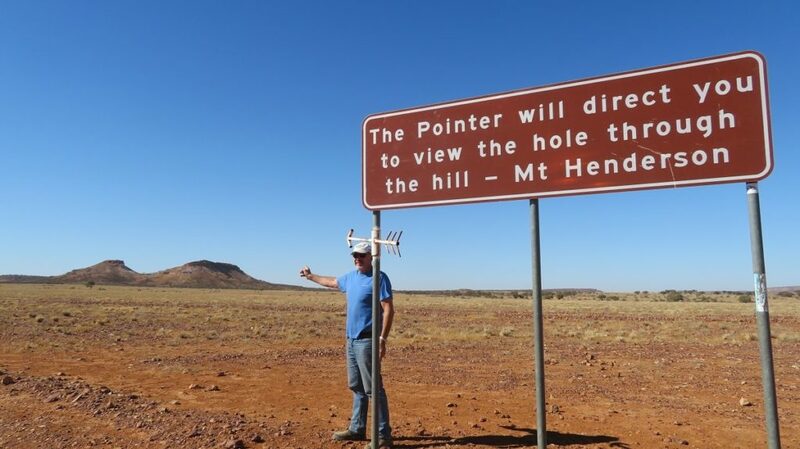 Not much further on was Deons Lookout where we drove up a hill for views out over the countryside. It would have been lovely to have had lunch here, if it weren’t blowing a gale. 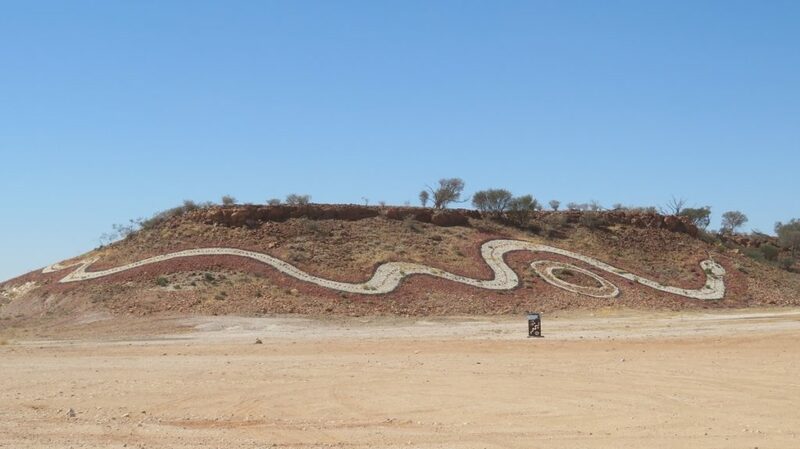 The next stop near Betoota was pretty stunning – the Dreamtime Serpent carved into a hillside. It’s quite a showstopper. 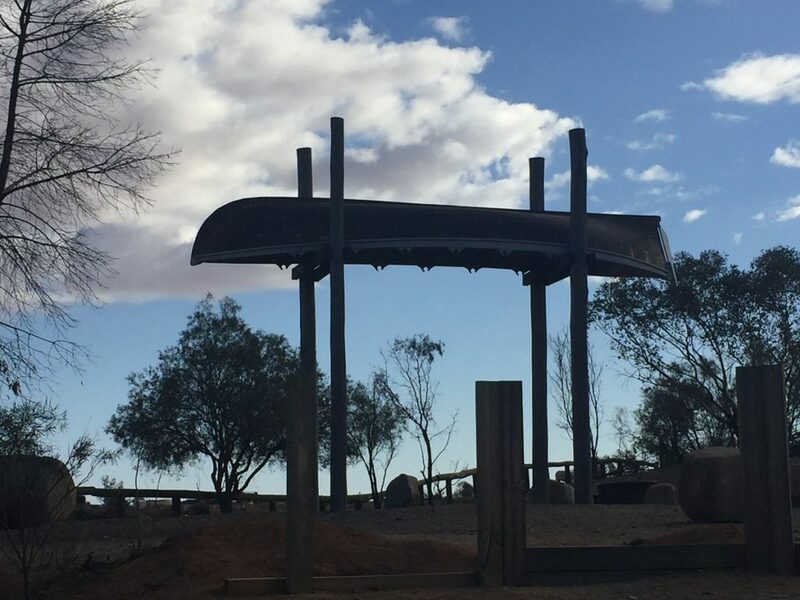 The Diamantina Shire Council has coordinated the ‘Sand, Dust and Gibbers’ project, funding sculptures designed and built in Bedourie, Betoota and Birdsville to help tell the indigenous Women’s Dreamtime stories. This is the Betoota installation. The Rainbow Serpent art project. The Rainbow Serpent is a creation story told by indigenous Australians right across the country. We stopped for lunch at Cuppa Creek, another dry creek bed but shaded and somewhat protected from the wind by the mulga trees. Arriving at last in Birdsville we booked into our ensuite cabins (small, but clean and modern) and went straight to the very iconic Birdsville Pub for a beer. 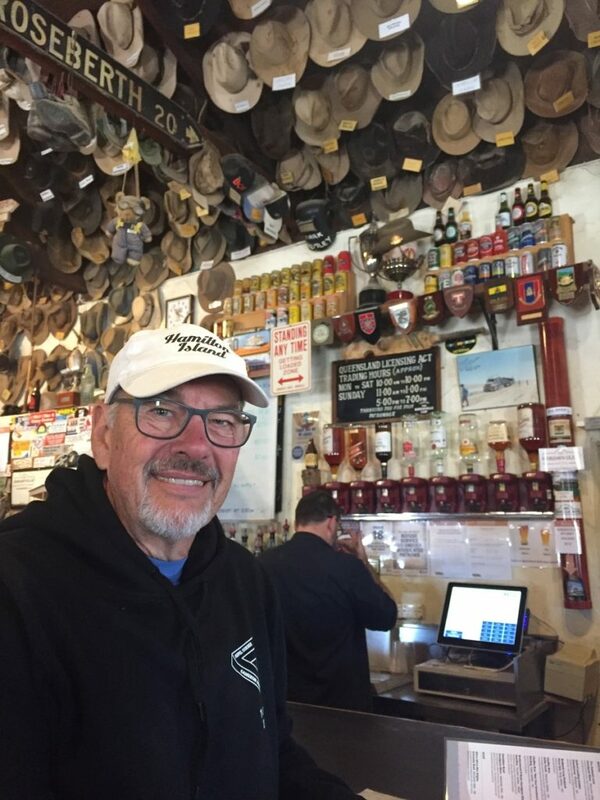 Inside the Birdsville Hotel, enjoying a drink at the bar. The akubras on the ceiling are from locals – well worn and well loved. All photos taken inside the pub require a donation to the Royal Flying Doctor, one I was happy to make, hoping we’d never need their services. The helpful lady at the Information Centre told us the Simpson Desert track to Poeppels Corner is pretty cut up and it will take us about 8 hours to cover the 175km. Oh dear. We’re well prepared tonight, fuelled up, brandishing our high-vis flags and everything inside the cars tied down. An early start tomorrow! We got away before 8am driving the 30 or so kilometres over a rough, corrugated, rocky road, to the beginning of the QAA Line and the dunes of Munga-Thirri National Park (Simpson Desert). Here we stopped to reduce our tyre pressures to 20psi. We crossed the dunes in Low Range Automatic. On top of our first sand dune. Many more to come. Note the high-vis flags attached to the bull bar that is a requirement when travelling out here. The initial apprehension we had soon gave way to quiet confidence as we crossed dune after dune, even though attention to the road can’t waver for even a few seconds. Some dunes were straightforward with reasonably firm sand, but the majority were challenging with lots of moguls full of soft sand which couldn’t be hit too hard, but still needing the power on to get up and over the dune. Many had turns in them halfway up, or turned suddenly at the crest, or had very soft sand at the crest. The tracks often split too as previous drivers had decided to make a different route up. In the later section of the track the descents were also quite difficult with deep, soft sand. One dune when I was driving got the better of me. I got ¾ up before the car dug into one of those moguls full of soft sand. I rolled the car back down to the bottom of the dune and hit it again with more power and we bounced and flew up and over. We named that dune ‘Denise’s Doosey’. Between the dunes there’d be 50m to 500m of flat track crossing clay pans, or dry lake beds or flood plains. Many times this track was corrugated. The flat area between sand dunes. This section is a clay pan which was cut up a bit from last time it rained. We stopped several times for a cuppa and for lunch and to check the vehicles – all good. All day we only saw about half a dozen vehicles heading eastward and half a dozen guys on motorbikes heading our direction. That was surprising – we all thought it would be lot busier this time of year. At about 2.30pm we crossed the border into the Northern Territory, though you’d never know it, there were no signs, before crossing a large dry salt lake and turning south along the lake, paralleling the K1 Line for about 20 km, which took us into South Australia and to our destination: Poeppel’s Corner, where Queensland, South Australia and the Northern Territory meet. After a looong tough drive we were all pretty happy to be here at Poeppel Corner. Note the dry salt lake in the background. In 1879 Augustus Poeppel surveyed this point and Haddon’s Corner which we’ll visit next. Unfortunately when he returned to Adelaide it was discovered his chain, which he used for measurement, was 1 inch too long and he had to return in 1884 to do it all again. My admiration goes out to him … he would have traversed vast stony, waterless plains, salt lakes and large sandhills. A pole with a plaque marks the corner point of the three States. We opened a bottle of champagne and toasted dear old Augustus and our day’s achievement. Funnily, after having seen so few people all day, 9 guys who’d left Dalhousie Springs on the French Line arrived within a few minutes of us, followed by 10 or so on motorbikes heading to the French Line. Celebratory drinks at Poeppel Corner. We started heading back to Birdsville putting an hour’s driving in before finding a spot just off the road suitable to camp the night. Sun downers after a long day. 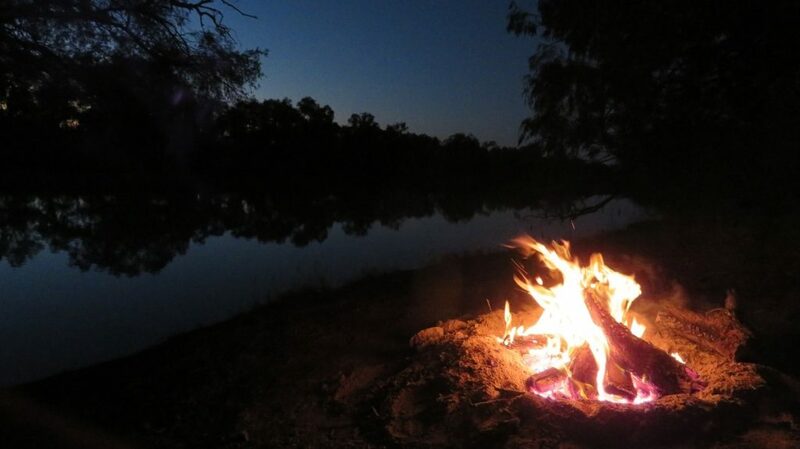 Magic night in the Simpson Desert. I love the afternoon light on the red desert soils. Loved the evening last night – no one for miles around, no lights at all, no noise and stars from horizon to horizon. (Just an aside: I told my 3 yo granddaughter the stars touched the ground and she wanted to know if I’d picked them up.) In the morning we saw quite a few animal footprints around which we thought could be feral cats. None of us heard anything, however another couple we met further along the track, who’d left their rubbish and a few other things out overnight, said they saw a huge cat dragging their rubbish bag around. Feral cats are a major problem out here and are endangering many of our indigenous small animals. The return trip was good fun – not that the trip out wasn’t, but now we knew what to expect and were much more confident, and the western side of the dunes wasn’t nearly as steep as the eastern side. We took time to enjoy the scenery, noting the vegetation and geological features indicated on the map. 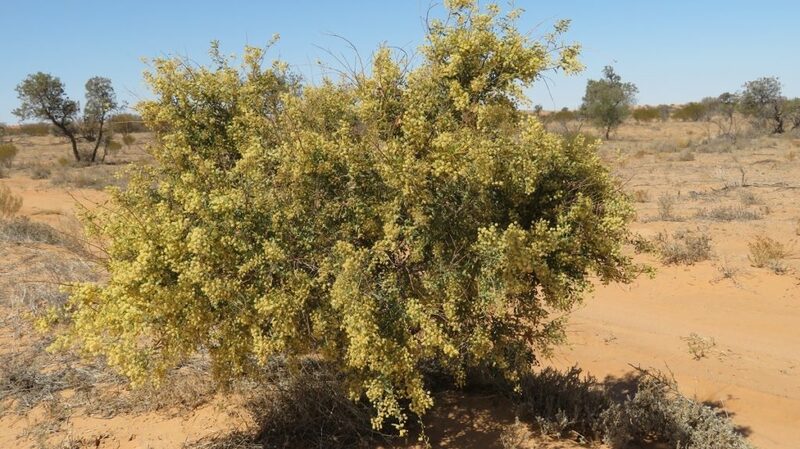 We passed through areas of hop bushes, salt bush, gidgee (mallee) and the acacias which are just beginning to flower. 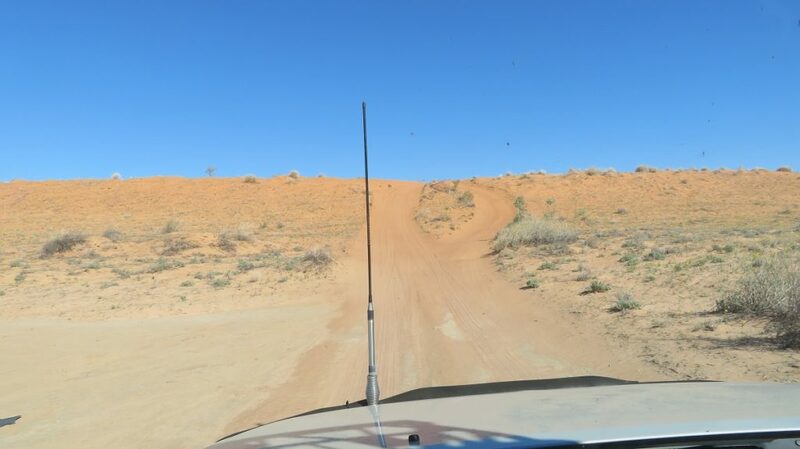 The final challenge was Nappanerica, or Big Red, which is the tallest dune in the Simpson Desert and a very popular spot to ‘try out’ your 4 wheel drive. Arriving late in the afternoon makes it a bit tougher as the sand is dry and the track chopped up. We took 2 attempts, learning from our experience each time, before successfully scaling it. Good fun! Returning to the Birdsville Cabins, we enjoyed hot showers and yummy steaks cooked on the BBQ in the excellent camp kitchen. We slept well. 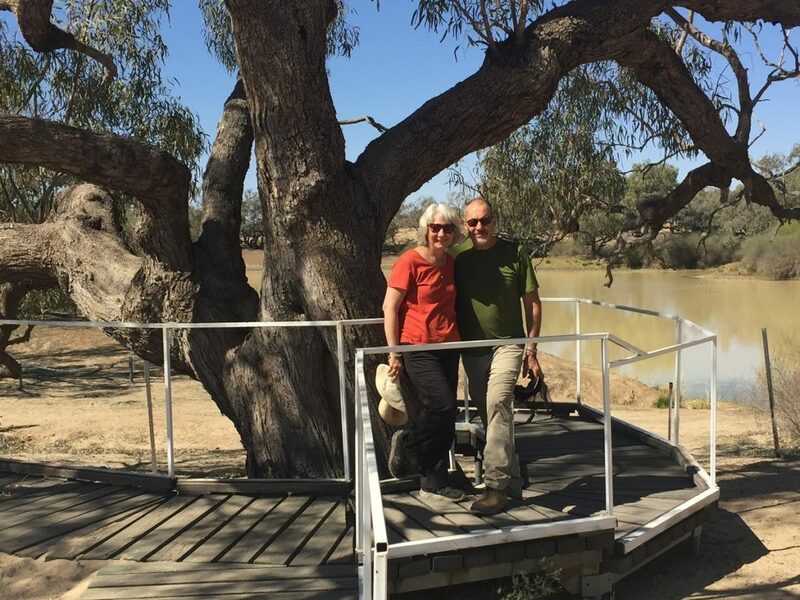 A day of rest and exploration in Birdsville. 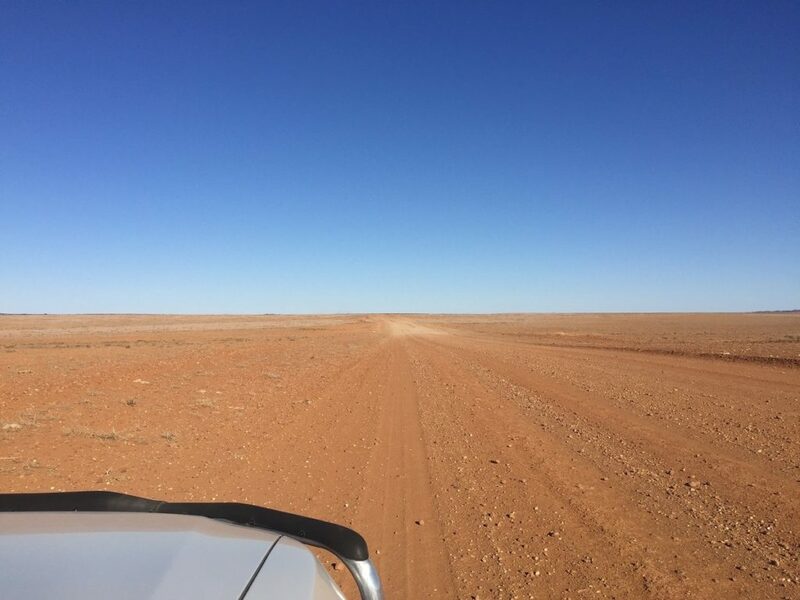 Birdsville was proclaimed a township in the early 1880s and is situated between the eastern edge of the Simpson Desert, the vast gibber plains of Sturt’s Stony Desert to the south and the rich Channel Country to the north – as we know, having driven through all of that. It was established close to the Queensland and South Australian border in order to collect tolls from the droves of cattle being moved interstate. After Federation and the abolition of tolls the town began to decline until now it has a population of only 115 or so. 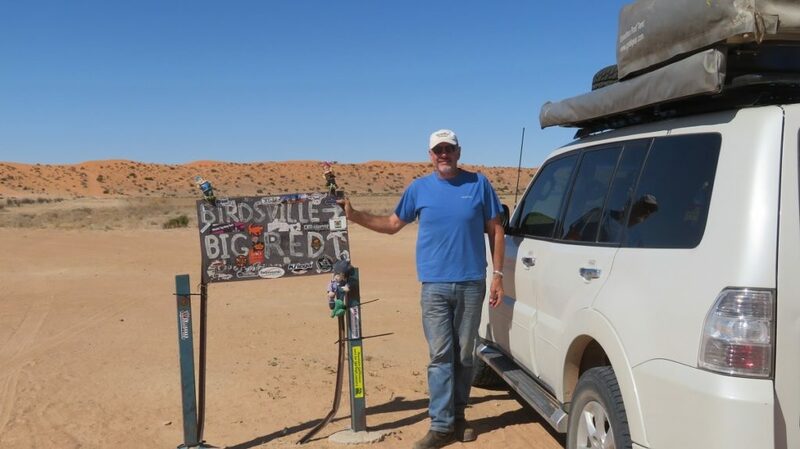 Tourism has joined cattle as the major industry in the region, with the annual Big Red Bash (a music festival) and the Birdsville Races (horse racing) each attracting around 9,000 visitors. The origin of the name Birdsville is disputed, however one popular theory relates to the numbers of birds around the lagoon on the edge of town. 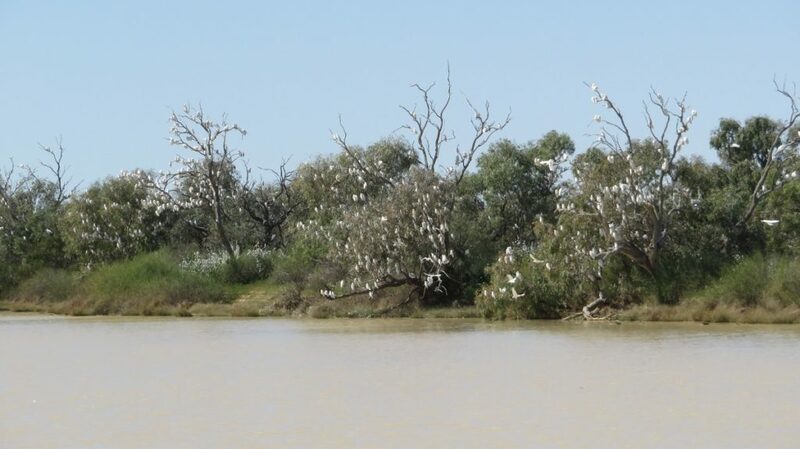 Corella’s in the trees at the Birdsville Lagoon. I wonder if it was these birds that gave Birdsville its name. A wander through the cemetery gave us pause for thought, noting the young age that so many died in the late 1800s and early 1900s. We loved the rustic charm of some of the graves – no big posh mausoleums here. Very simple graves out here. Note the engraving in the rock as the headstone. We had lunch of curried camel pie at the bakery (meh), and spent some time in the Information Centre looking at their displays and information. Eating camel pie at the Birdsville Bakery. It was … OK-ish. 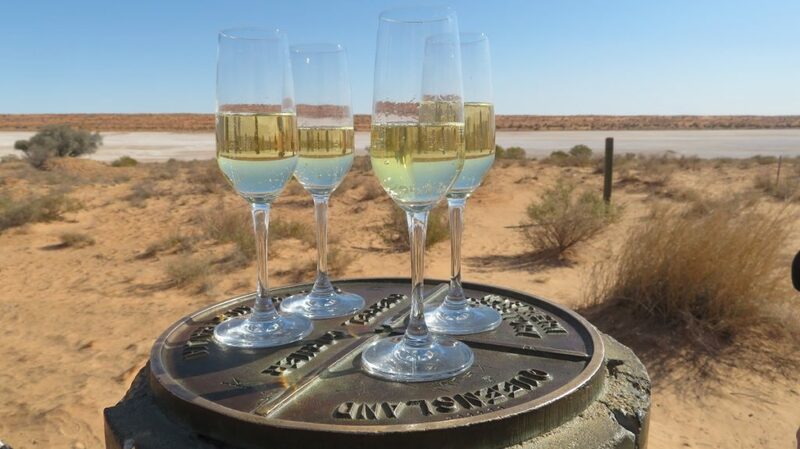 Birdsville has Australia’s only geothermal power plant which provided 20% of the town’s elecricity needs from the very hot water from the Great Artesian Basin. However, just two months ago the decision was made to close it down, replacing it with solar and battery storage which is expected to provide about 80% of their needs. We also got the washing done – woo hoo clean clothes! In the car park we happened upon a Qld Health woman who told us the “My Health Record” explanation was happening in the community centre this evening, so Leura and I decided to go. We had a hoot – I even got offered a job. 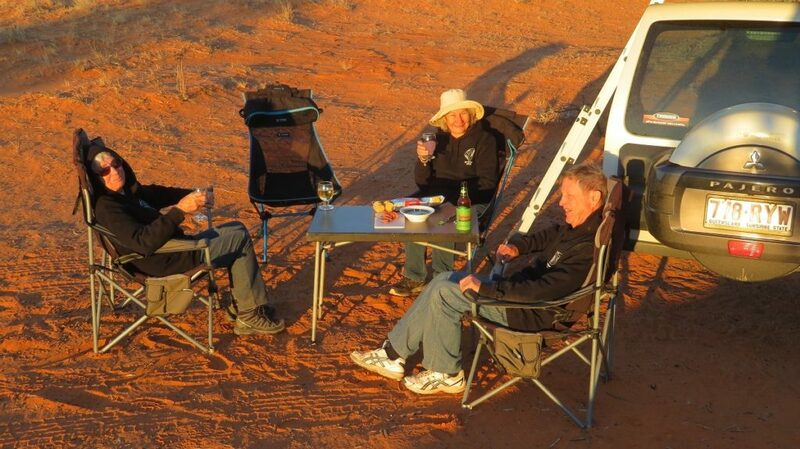 Dinner at the Birdsville Pub was very good before retiring to our cabins for the evening. Not too far to go today, so a relaxed start. 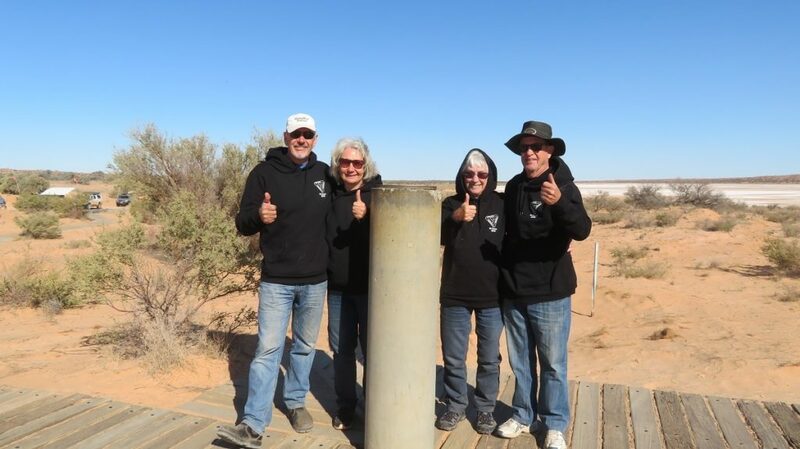 We retrace our steps from Birdsville to the Innamincka turnoff, stopping just outside Birdsville to view the Burke and Wills tree – their last camp before Cooper Creek where they were hoping to meet the rest of their party. Back at Cuppa Creek we stopped for a cuppa, then on to the now very pleasant Deons Lookout for lunch. A 7km detour off the main road took us to the ghost town of Betoota, it’s last resident, the publican, moving out in 1997 at the age of 82. The Betoota Races are run here every year in August. The only building that remains is the sandstone pub, which had been in ruins, but is now being renovated, though still very rustic. 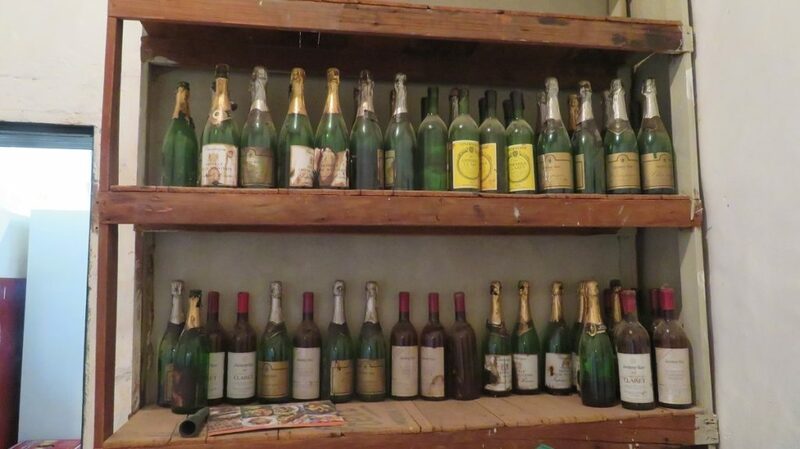 There were quite a few 1978 and ‘79 red wines in their cool room, though they looked a little the worse for wear. Some of the old wines leftover from prior to closure of the Betoota Hotel. The bulldozers had graded more of the road leaving only about 50 or 60 km that was really rough, the rest being a quite good gravel road. Even the first 10km of the road to Haddon Corner was good, just a bit at the end became a track before we crossed a couple of sand dunes to get to Haddon Corner. 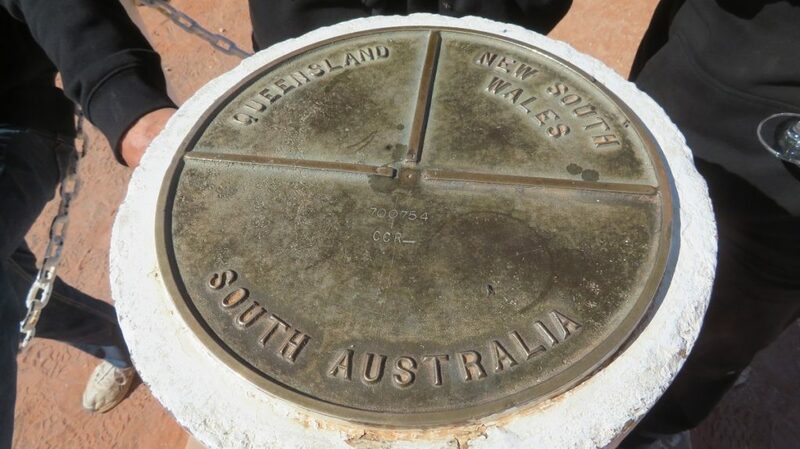 Augustus Poeppel also surveyed this point as he marked the western boundary of South Australia. He met up with the Queensland surveyor Alexander Salmond and together the surveyors took star observations for latitude to fix the position for what is now known as Haddon Corner, named after the nearby pastoral lease. More champagne to celebrate our second Corner. Another celebration, at Haddon Corner. A large flat area surrounds the Corner post and this is our campsite for the night. Flys! Flys are the predominant feature and fly nets made their appearance for the first time this trip. On the upside, we’re the only ones here. 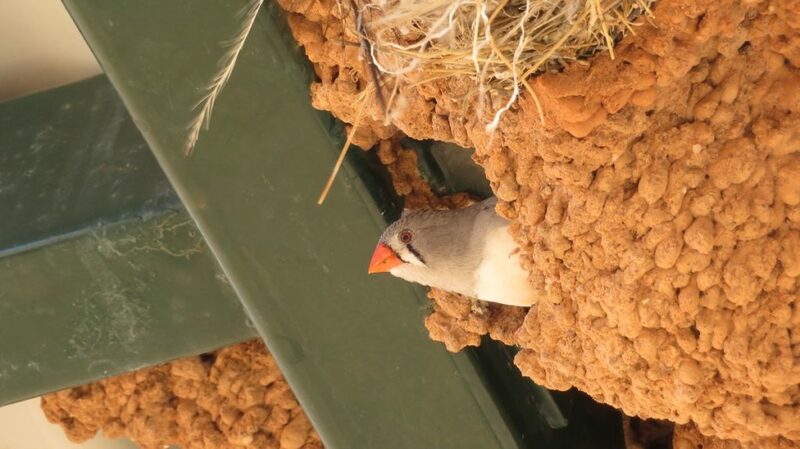 Under the roof of the covered picnic table the finches have built quite complex mud nests. They’re very cute. These beautiful little finches have created amazing mud nests under the roof covering the picnic table. Haddon Corner. We collected some dead mallee wood on the way in and had the best fire – it’s so hard and dry it burnt slowly with very little smoke. Lovely colours of sunset at Haddon Corner. 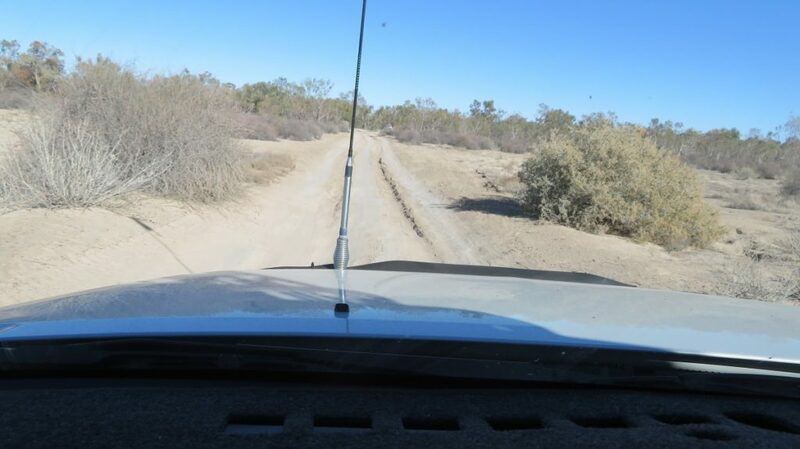 Today we’re off to Innamincka via the unsealed Station roads. 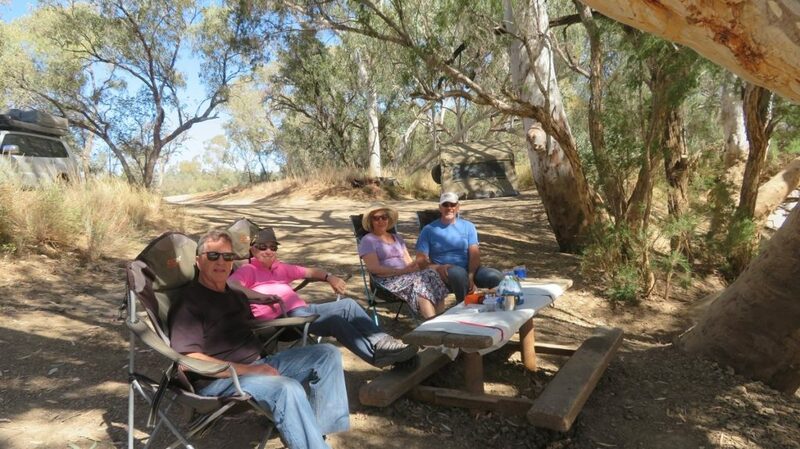 We had our morning cuppa under some trees beside a dry creek bed at the junction of the Barcoo and Bulloo Shires. The countryside has been largely treeless, some clay pans and lots of gibber plains. Good to see some hills in the background, but not much else to commend the view. However in some areas there’s a good covering of grasses and the cattle looked in good condition. The roads on the Qld side of the border were very good compared to the SA side where we did battle with the very corrugated and rocky surface. 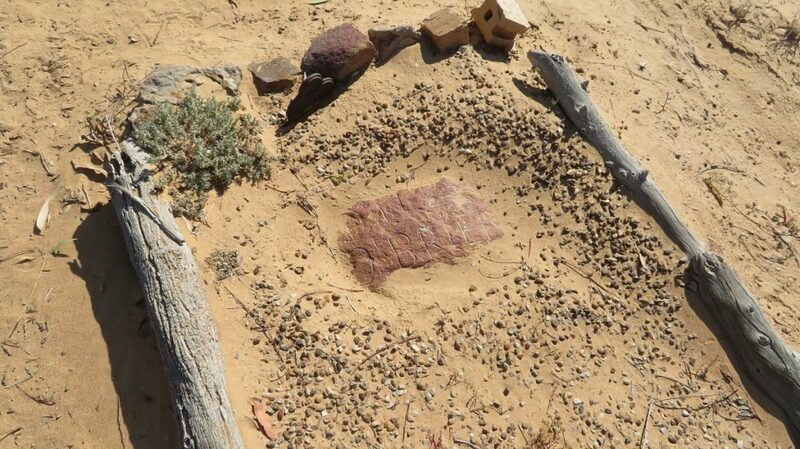 The Dig Tree on the banks of Cooper Creek near Innamincka is significant in Australia’s pioneering history. What a tragic story that is! Burke and Wills and quite a retinue of other men, camels, wagons, etc set off in 1861 from Melbourne to explore to the Gulf of Carpentaria, ie south coast to north coast. Burke was an unlikely leader of the expedition having virtually no skills in bushcraft and limited leadership experience. He set up a base camp on the banks of Cooper Creek, taking only 3 men with him after instructing the team remaining to wait 3 months for their return before leaving. 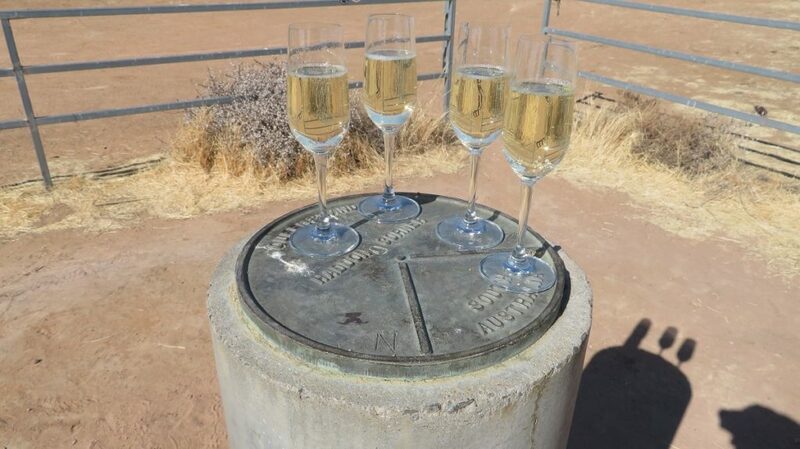 Very unwisely Burke left here in December to cross the Strezelecki and Sturt Stony Deserts where termperatures can reach up to 50C (122F) in the shade, not that there is much shade! Anyway, they made it to the Gulf, no mean feat, but it would be a total of 4 months before the 3 remaining men of the party got back to Cooper Creek (one man had died of dysentery). By this time they were close to starvation. Tragically only hours before their arrival the waiting party had left, leaving a carving on a tree indicating the location of some buried provisions – now known as the Dig Tree. Burke and Wills both perished here, King survived with the help of the local aboriginal people and later returned to Melbourne. At the Dig Tree, not far from Innamincka. 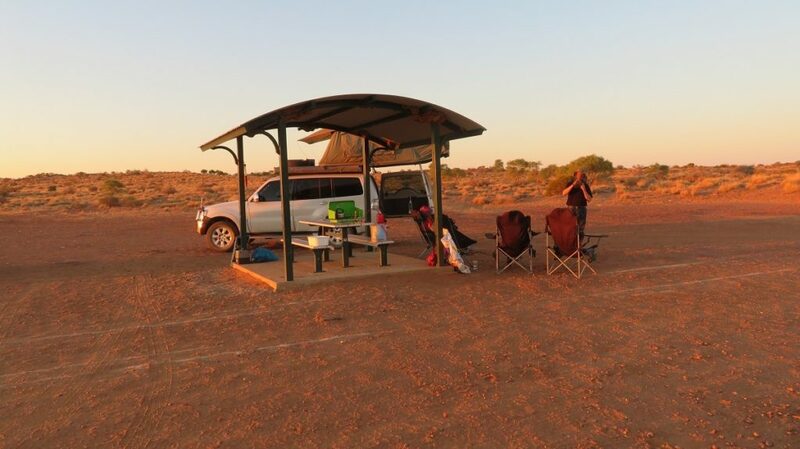 We lunched here then continued on to Innamincka where we had a beer at the pub, refuelled the vehicles and enjoyed a great hot shower before setting up camp beside Cooper Creek. 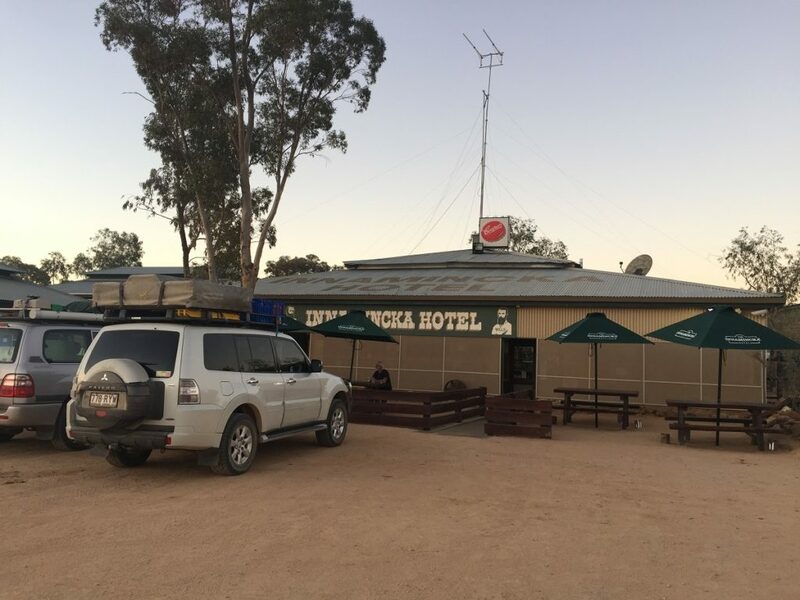 Innamincka has a population of 12 – nope not a lot here, though the man at the General Store was very knowledgeable about the road conditions and advised us on a better route to our next Corner. Dinner at the pub tonight. 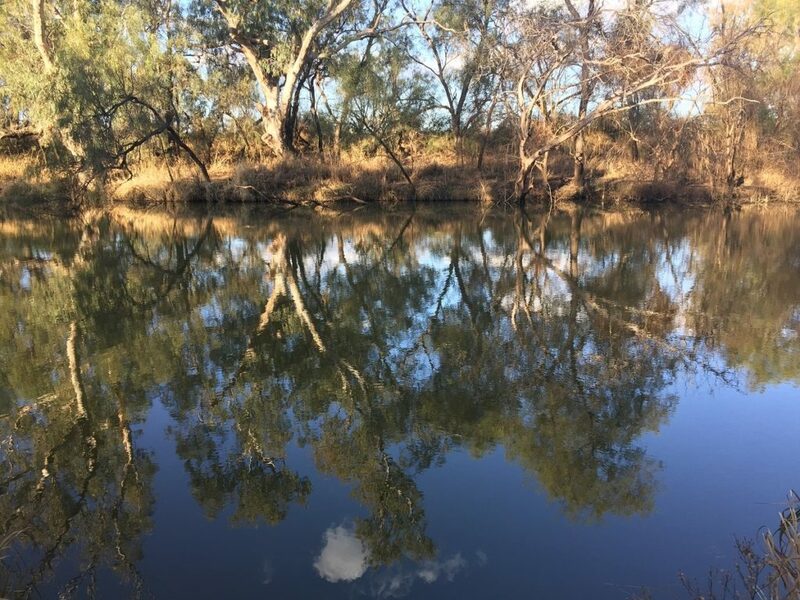 Beautiful reflections of the River Red Gums in Cooper Creek welcomed us when we awoke this morning. Lots of corellas, galahs, and a pelican fishing too. We left Innamincka via the Strzelecki Track which had been recently graded and was a pleasure to drive on. This is still sand dune country, though not soft, loose sand as it was it the Simpson Desert. The dunes track north-south, making it easy for the Strzelecki Track to head south between two dunes. 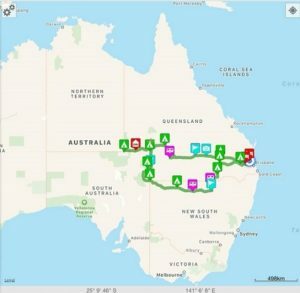 Our route though needed to take us eastward into Queensland and that road was more challenging with corrugations, lots of sand and heaps of up and over crests of dunes. It was a lovely drive though with yellow flowers contrasting against the dark red sands of the dunes, a few acacias flowering, salt bush and spinifex and a pretty amazing looking clay pan. Lots and lots of gas wells in this area. The Epsilon Omicron Road took us back southward again. Epsilon and Omicron are two cattle properties. The cattle we saw as we drove looked to be in good condition – perhaps the drought that’s affecting farmers further south isn’t as bad up here. 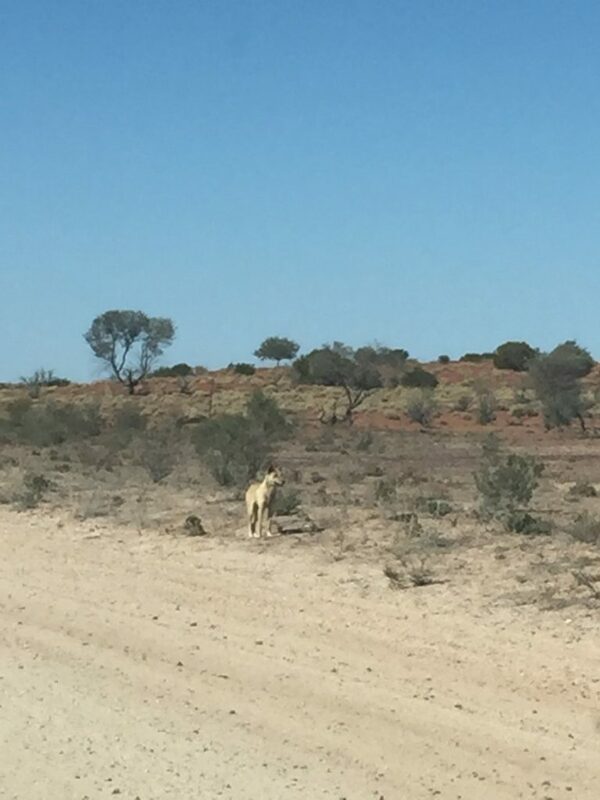 We saw a few kangaroos and a couple of beautiful dingoes. A very healthy looking young dingo. Cameron Corner, the last of our three corners, was today’s goal and we got there in time for lunch. There’s a pub and a “Corner Store” here, and of course the pole that marks the corner of South Australia, Queensland and New South Wales. Champagne time again! 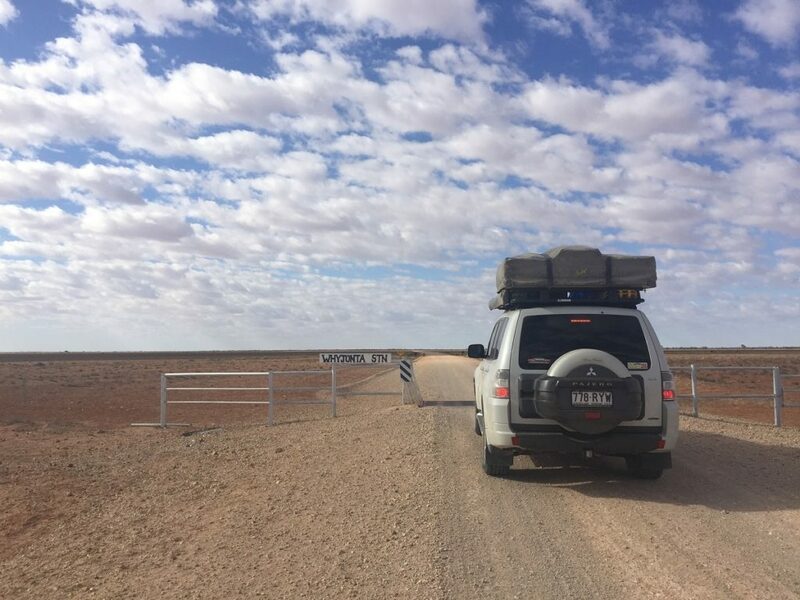 The camping area was shade-less and uninviting so we continued on to Tibooburra via the Tooney Gate road. We were warned that the first section of it was rough and they weren’t wrong! Corrugations, pot holes and clouds of dust from oncoming vehicles was very wearying. Anyway that didn’t last forever and we did get some good, firm road too. 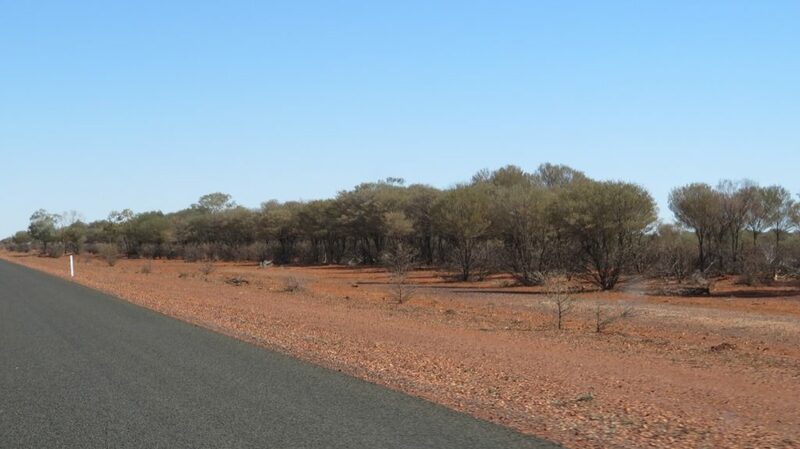 This part of the drive was very stark with bare flat red sand plains or gibber plains with no vegetation. As areas with salt bush began to appear we started to see sheep properties. It was a relief to finally drive into Tibooburra and check into the caravan park. 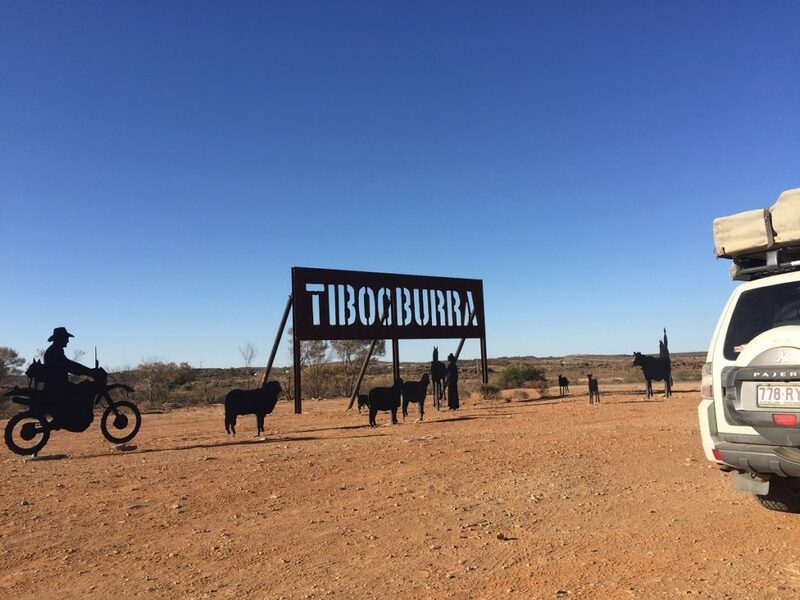 Tibooburra is a tiny town with a population of only 134. Gold is why it was established and it still attracts fossickers. The few locals and the passing tourist trade supports not one, but two pubs and a Roadhouse that sells fuel, groceries, is the post office and takes bookings for the caravan park! A fossilised tree trunk dating back to the Cretaceous period is displayed in a glass case alongside the road in town. The entrance to Tibooburra is pretty impressive. We cooked our own meals but then went to the pub for their Happy Hour. What a great atmosphere! The place was full of locals and travellers and the pub supplied ‘bar snacks’ – chicken wings, meatballs, sweet potato chips, dim sims … pretty good! We bought tickets in a raffle to raise money for an intensive care bed for the medical clinic (their only bed) and won a cooked chook! Altogether a fun night. A replica of Sturts boat at Tibooburra. In August 1844 explorer Charles Sturt set out from Adelaide on an epic journey to find an inland sea. He also wanted to prove that a great river or mountain range divided the continent. He took with him a party of 15 men, 200 sheep, 11 horses, 32 bullocks and seven carts. Indeed, so confident was he of finding this sea he took a 22-foot sailing boat and two sailors to crew it. Another big driving day. The road to Wanaaring was OK for the most part, though a large section had lots of washouts and pot holes full of bull dust. It was a very windy day and the sand was being blown up a lot. Wanaaring is a small town where we really only stopped in the shade of the playground to eat our lunch – last night’s winnings, the cold chicken! Passing through Station properties on our way. The road to Bourke was atrocious! 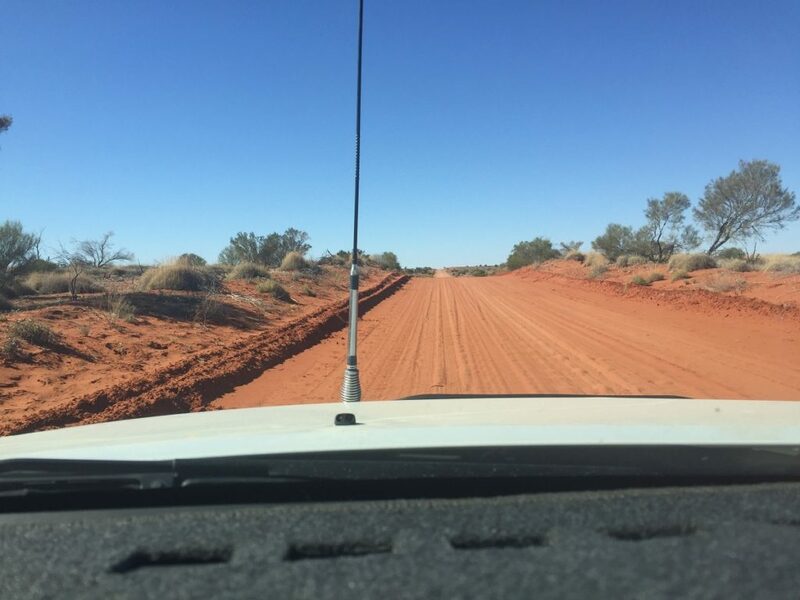 Kilometres and kilometres of corrugations, pot holes, soft sandy patches and bull dust. If that wasn’t enough to keep the driver focussed kangaroos and emus appeared frequently alongside the road, ready to dart in front of you without a moment’s notice. We were told the bulldozers are unable to grade the road during this drought because there’s no water, and that the road is only open to high clearance 4-wheel drive vehicles with extreme caution. We were definitely very cautious. As we came closer to Bourke the vegetation became thicker, greener and taller. By the time we arrived we were passing trees! Exhausted by the time we arrived at 4.30pm, we elected to stay in a motel. Dinner this evening at a local restaurant (average), then back to the rooms for an early night. 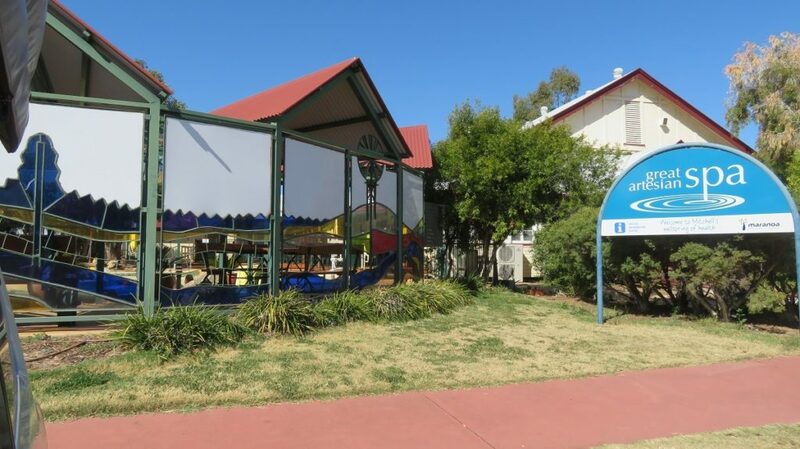 Situated on the Darling River with a population of more than 1,800, Bourke is the administrative centre for the Shire. 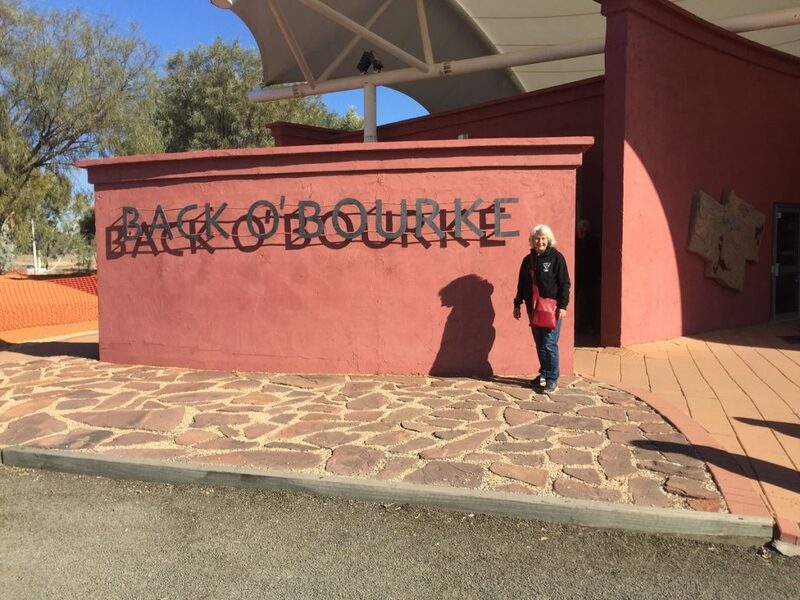 In 1835 Sir Thomas Mitchell established Bourke as the first and only stockade in Australia for protection from the aborigines. Percy Hobson, the first indigenous athlete to win a Gold Medal at the Commonwealth Games came from Bourke, and the famous eye surgeon Fred Hollows was buried here in 1993. Before leaving Bourke Steve and I visited the Back o’Bourke Centre. This Centre is quite extensive with 4 large buildings, including the Information Centre. Information, photographs and stories about Bourke’s beginnings and history abound. Maybe we just weren’t in the right mood, but neither of us enjoyed it. Steve was disappointed at the lack of information on the local flora, fauna and geography while indigenous life before white settlement was ignored. I found there was just too much writing to read. If I read it all I’d still be there. We did a bit of shopping at the IGA, then met up with Doug and Leura again at a cafe before heading east through Brewarrina and Walgett where we stopped for lunch at the park. Heading north we arrived in Lightning Ridge where we’re booked in to cabins in the caravan park for two nights – fortunately as there’s a cold wind blowing quite strongly and the morning temps will be around the zero mark. Wow! ALL of today’s drive was on bitumen. What a treat. We played Tourist today. 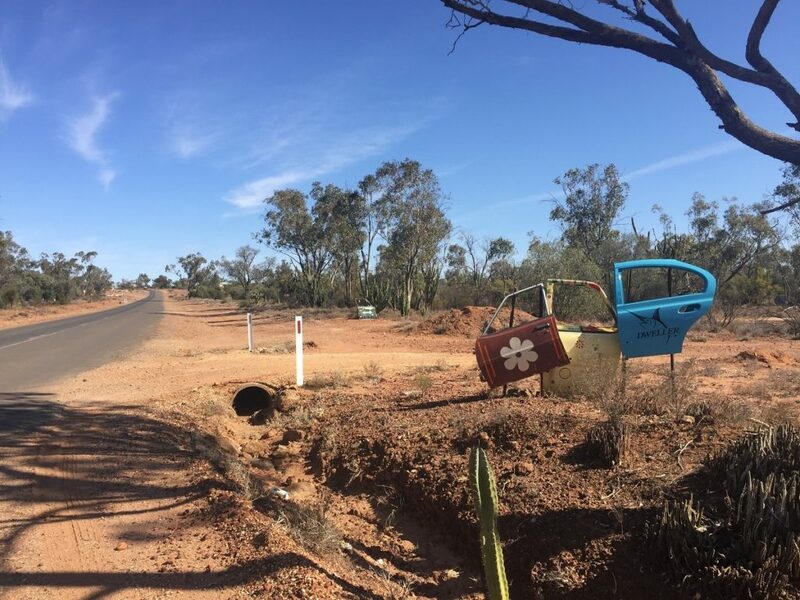 Lightning Ridge’s indigenous people were displaced in the early 1800s by pastoral leases. When the rare and very valuable black opal was discovered in early 1900 it led to an influx of miners and the establishment of the town. Today the population is about 2,200 though, like most mining towns, it is transient. With mid summer temperatures averaging 35 – 36C with an annual rainfall of only 475mm that’s not surprising. The John Murray Art Gallery was fabulous. 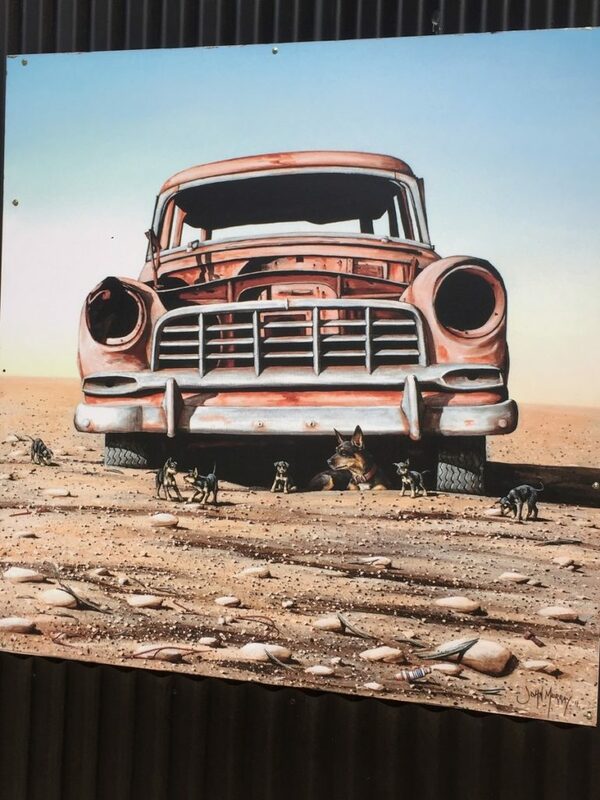 This city-born artist came out here about 25 years ago and fell in love with Australia’s arid landscapes. He describes his painting style as ‘whimsical photo realism’. However it’s described, his landscapes have a clarity and colour that is beautiful, while his caricatures of birds and other creatures are definitely a flight of whimsy. John Murray art. Displayed on walls outside his gallery. Stanley the Emu, on the outskirts of Lightning Ridge is one such whimsy. 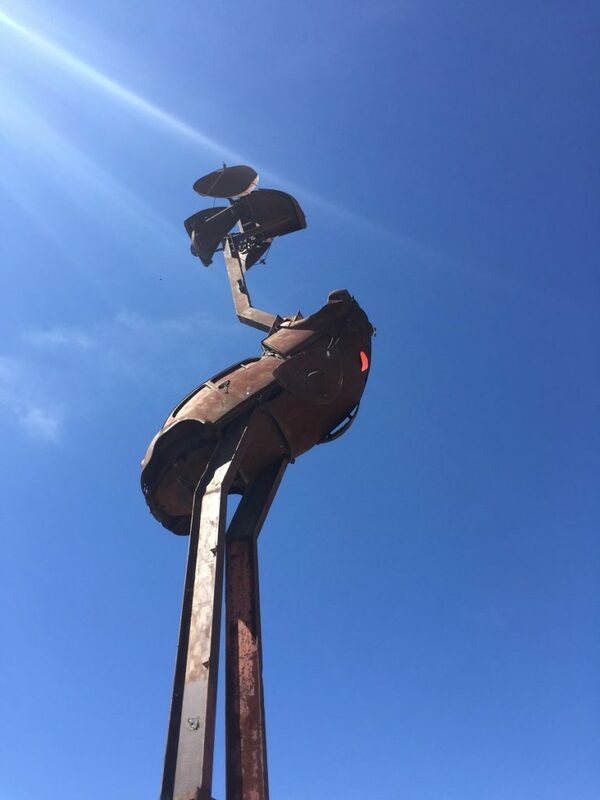 Stanley is an 18m tall emu designed by John Murray and made from scrap metal including a VW Beetle chassis, hoods and doors, satellite dishes for his ears, recycled metal from the old Dubbo Police Station & steel girders for his feet & neck.. 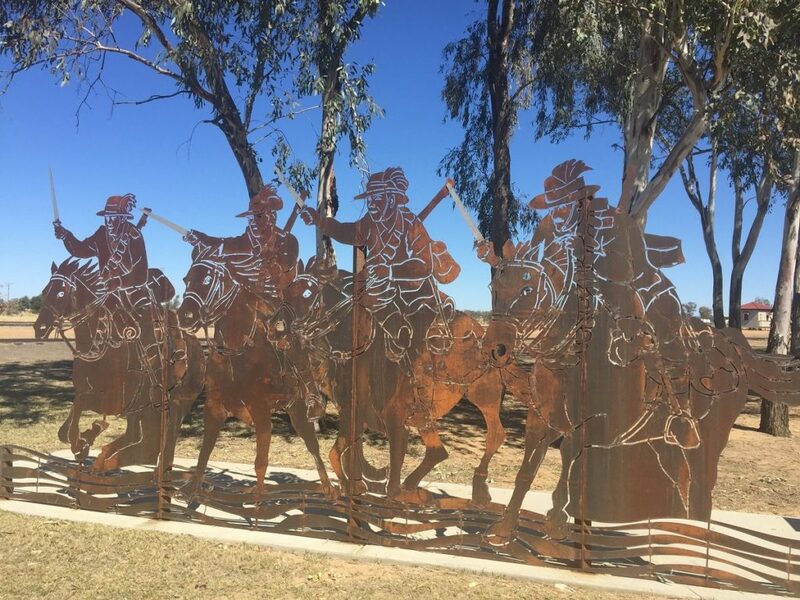 The emu is named after a former Lightning Ridge policeman, Commander Stan Single, who was instrumental in ‘supply’ of much of the materials that the emu is made from. Stanley was officially unveiled in May 2013 and contains a time capsule due to be opened in 2063. Stanley, the 18 metre tall emu made from scrap metal – including a VW beetle chassis. There are four ‘car door tours’. A map to these self-guided driving tours is obtained from the Information Centre. Not quite sure how they were initiated, but we did notice that old car doors not only mark a ‘place of interest’ on the tour, but are also used to identify private residences. The opal mine we visited, the Chambers of the Black Hand, was a relatively unproductive opal mine for many years before the owner began mucking around carving into the sandstone layer above the silica layer in which the opal is formed. Turns out he is a pretty reasonable sculptor. 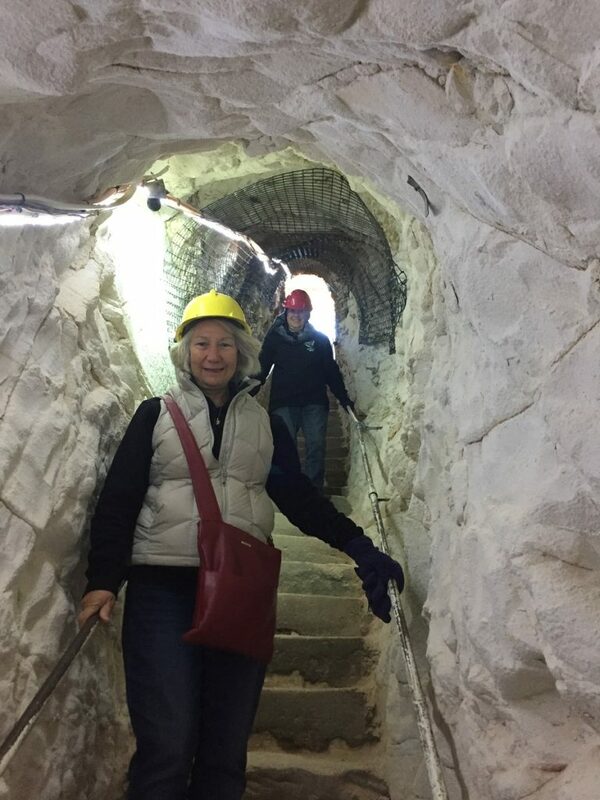 Now viewing these underground sculptures and a tour of the opal bearing layer led by an opal miner who shares his experiences (sometimes a little too graphically) are what draws the tourists. An underground opal shop also shows off exquisite local opals and the jeweller’s skills. Entering the Chambers of the Black Hand mine. Late afternoon we went to the Artesian Bore pool. Wow! That’s the hottest spa I’ve ever been in. The pool is filled directly from a bore into the Artesian Basin. The water termperature is around 40C. Sitting half submerged and varying the bits in the water made it tolerable. It was a very refreshing experience though – once out. Lightning Ridge, like other small towns we’ve visited with privately owned mines, is defined by numerous mullock heaps, unguarded mine shafts and old rusting machinery. They also seem to be set in the driest, dustiest places. Credit where credit is due though, the town streets are most well cared for. So many mining towns look like this. Leaving Lightning Ridge and its dust behind us our road (still sealed – bliss!) took us through prime grain-growing countryside. A stopover for a walk around and a cuppa at Dirranbandi led us to some interesting sculptures in the park. Dirranbandi was the embarkation point for many men and their horses who joined the Light Horse Brigade for World War 1. A memorial recognising their contribution is displayed. Continuing with the horse theme there’s also a very good sculpture made entirely out of horse shoes. Memorial to the men who fought on horseback in World War I. Many of them and their horses left from Dirranbandi. Onward to Thallon where we stopped to admire the painted silos. 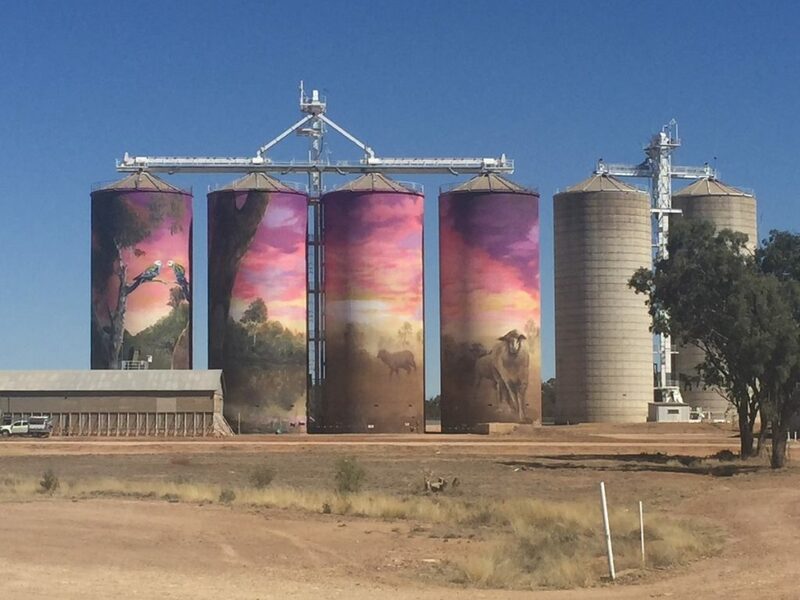 Painting silos has become a ‘thing’ in recent years, and I must say these examples of public art have been excellent. The Thallon silos showcase a stunning sunset scene over the Moonie River acknowledging the first owners by depicting a scarred tree. A free camp here between the silos and the river looks pleasant enough, however we have a lunch date in Nindigully. 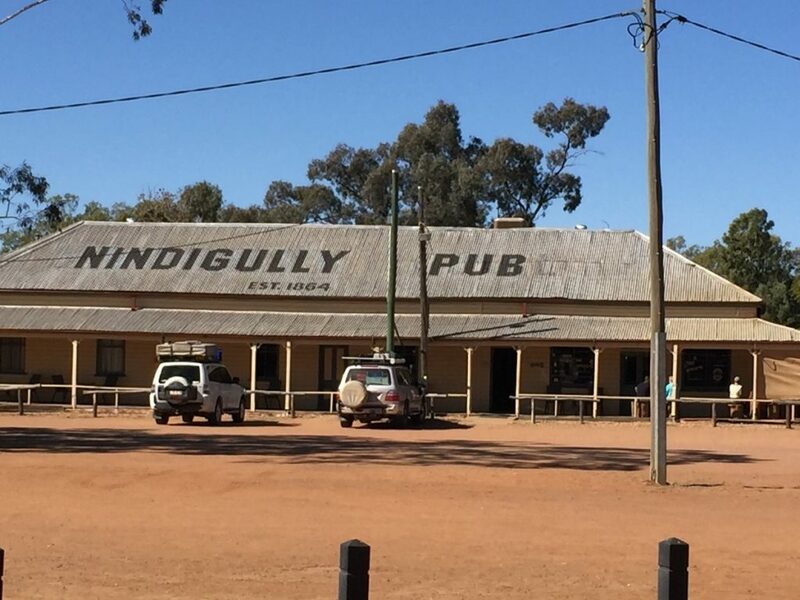 Nindigully Pub is Queensland’s oldest pub still in its original condition and location, and has been continuously licensed since 1864. There’s a lot of history in this pub. 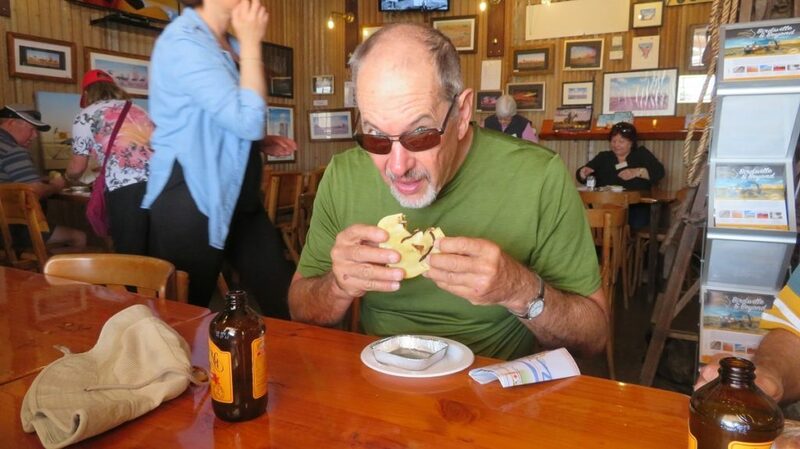 We lunched in the beer garden, Doug and Leura enjoying the pub’s famous hamburgers while Steve had a ‘Deathwish’ – an enourmous sausage with loads of chips. (To be honest our meals weren’t that great!) There are only 2 houses and the pub at Nindigully, with a population of 6 – but it’s a must-visit destination. We drove on through sheep and cotton-growing country to St George. A wander around the town found us admiring the many beautiful, old buildings before arriving at the Unique Egg. These exquisitely carved emu eggs are displayed beautifully with lighting and mirrors. A very talented craftsman. Another ‘cabin night’ at the caravan park – nice, new clean cabins tonight. Our first stop today is Surat. This lovely little town situated on the Balonne River (yep, one of the rivers that will become Cooper Creek) has the best Information Centre ever. A full size replica of a 14-seater Cobb and Co Coach and a scale model of the 7-horse team that would draw it makes me feel guilty for complaining about the rough ride over unsealed roads in my well-sprung, air conditioned speedy car. 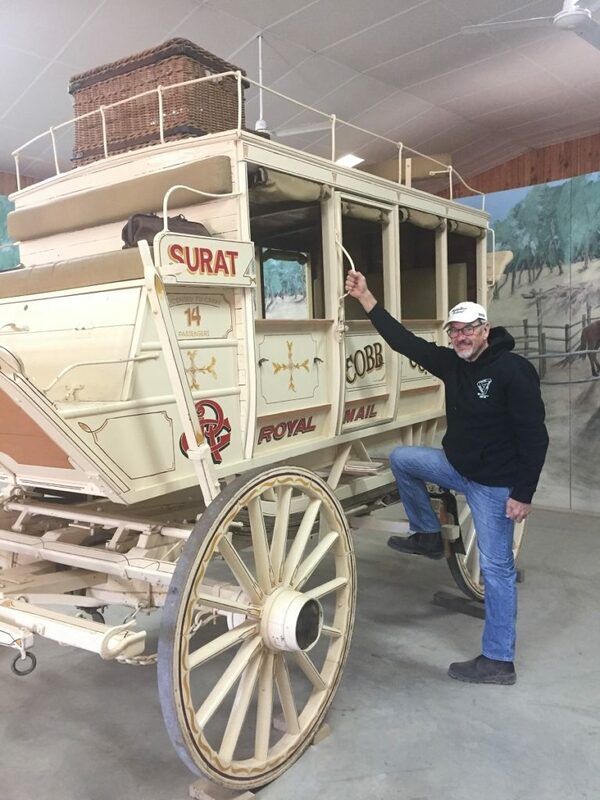 A Cobb and Co stagecoach at Surat. The history display is very well curated, but of even more interest is the aquarium. 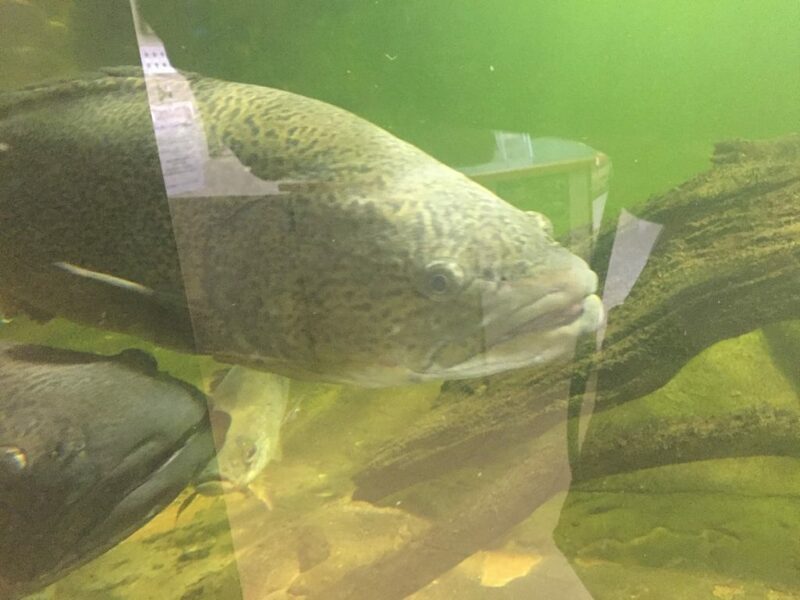 This 25,000 litre fresh water aquarium has native fish species such as the Murray River Cod. Now THIS is an aquarium – at Surat. 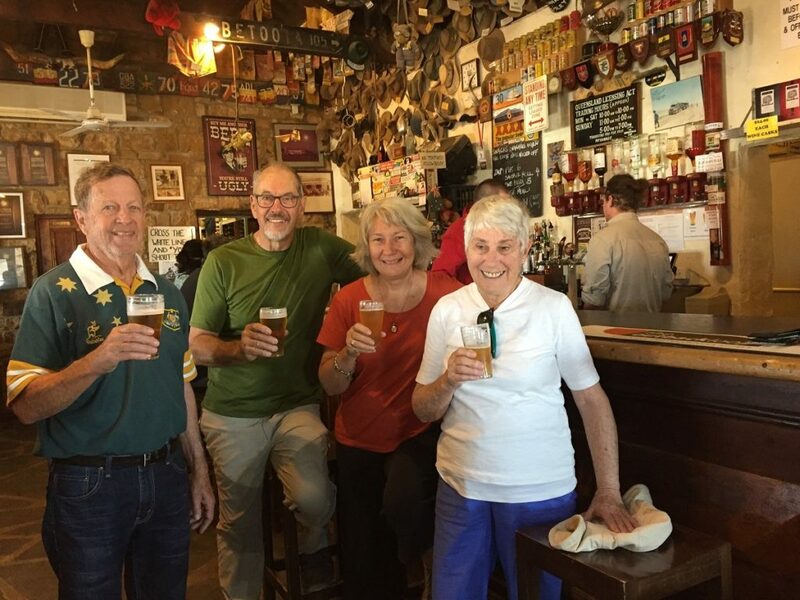 Here we farewelled our wonderful travelling companions Doug and Leura as they headed home and we continued on to Crows Nest to stay the night with our friends Randall and Catherine. Home today. 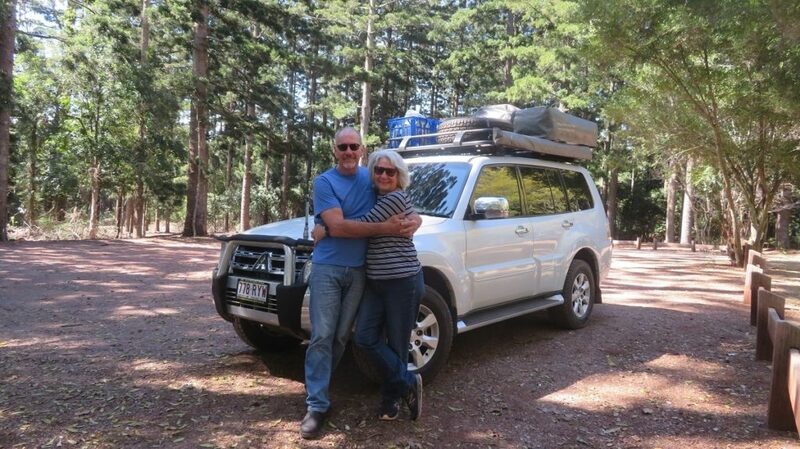 Keeping the adventure alive we drove via backroads we’d not travelled before and reminisced on a fabulous trip – many great places we really enjoyed and will maybe visit again. Altogether an excellent trip with unique experiences, enjoyed with good company. So much Australia, so little time. To see all our photos from this trip CLICK HERE.